Awesomeness is being greeted by a 37-foot ketch in Cape Town Harbor and its crew of ZS ham friends. We are grateful for their assistance in getting us into the dock and processed by the SA customs and immigration folks. 1530 UTC: We are now docked, and we have been processed by customs and immigration. 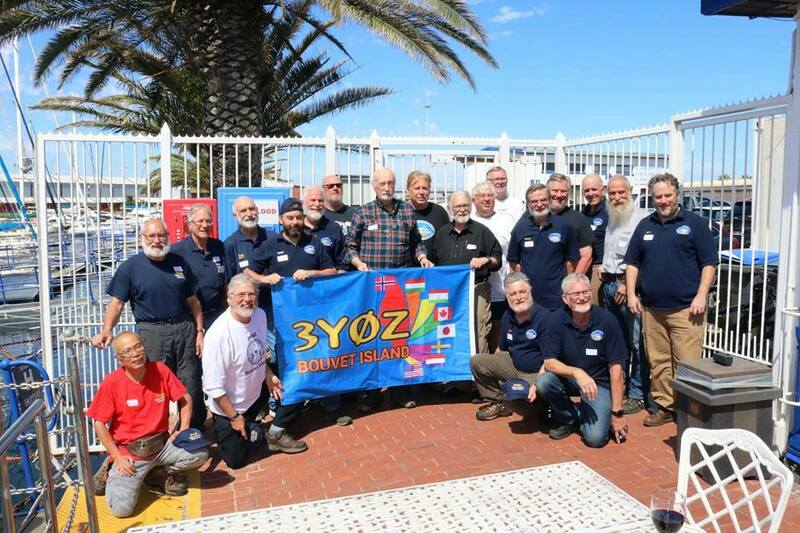 The 3YØZ banner was signed and presented to the Cape Town Amateur Radio Centre. The Cape of Good Hope is in sight, with Tabletop Mountain rising majestically above the sea. A tugboat shot a line to us to deliver updated local charts, and we are proceeding toward dry land. We’ve been at sea and aboard this vessel for over a month now. For some, this has been a difficult time, but now stability and dry land is on the horizon. I’m not sure, but this may be our last update until we arrive safely at our homes. If it is, thank you once again to all of you for your support during this difficult time. We’ve enjoyed the “GLs” and “dit-dits” during our 9,000+ maritime mobile QSOs. It was nice to have you riding with us. Finally making it to Cape Town. It’s been a long haul…..
February 16, 2018, 1320 UTC: ETA at Cape Town harbor is 0930 on Saturday morning. We understand that immigration and customs will come aboard at 1700, and we will likely be cleared to depart the vessel. DAP has us all booked into a local hotel near the waterfront. On Sunday, there will be a reception held at a local yacht club sponsored by a local radio club and numerous DXers. We are very much looking forward to that and are certainly honored. The first of the team will begin departing for home on Sunday night, and the majority will be on their way Monday evening/early Tuesday morning. A few more will straggle out and be on their way home on Wednesday. When we depart the vessel on Saturday, that will be our 31st day aboard the ship. Needless to say, we are ready to set foot on dry, un-moving ground once again. Ralph and I are very proud of this team. They have endured many hardships since departing home in early January. They have been patient and resilient and good company. There will be more updates in the future, as we begin to unravel this attempt and plan our subsequent strategy. February 14, 2018, 1645 UTC: We continue our slow pace toward Cape Town. We are currently making 5.6 knots and are 293 miles from Cape Town. We are showing 2 days and 5 hours until we reach Capetown. The weather is pleasant. Our seabirds have decreased in number since we left cooler waters. Recently, a pod of Orcas passed by, and the bridge spotted a whale. Those were the highlights of the day. There’s not much left for us to do. We have one /MM radio to occupy the 20 of us. It’s a bit difficult to arrange and confirm our flights home and to prepare for Customs/Immigration in Cape Town without the internet, but we are managing — sort of. 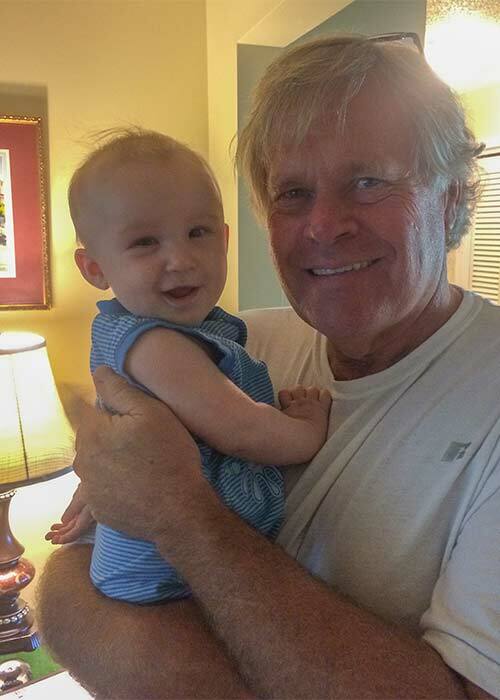 Thanks again to everyone and the good wishes we encounter on the air. The “dit-dits” are appreciated. February 8, 2018, 2045 UTC: 49.32 degrees South, 6.73 degrees East. 1,058 nautical miles from Cape Town. We are continuing our slow voyage to Capetown, currently making 6 knots, with one of our two engines out. The team is healthy, with plenty of food and water, and working to keep our spirits up. We cannot, however, escape the cloud of disappointment hovering over us and the DX community. 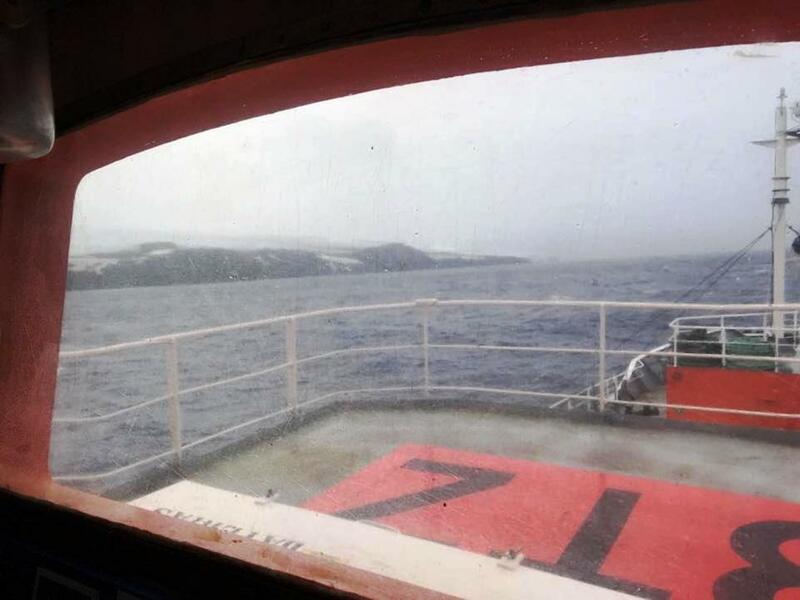 We traveled 2700 nautical miles to Bouvet, but the last mile proved to be the most difficult. As we type this, a tugboat is on its way to assist our vessel to the port of Cape Town. We will continue to keep everyone informed, as this saga plays out. We would like to thank all of our friends and families who have been with us every mile of the way. Your good wishes, thoughts and prayers have sustained us over the last three weeks. February 5, 2018, 0930 UTC: Our captain has decided that it is in the best interest of safety and expediency to proceed directly to Cape Town, South Africa rather than Punta Arenas, Chile. We are now heading north to avoid the possibility of encountering ice. Currently, there is no ice in sight or on radar. In due time, we will head easterly toward Cape Town. 1445 UTC: Position: 53 degrees 42 minutes South, 0.41 degrees West. Heading 58 degrees. Speed 7 knots. The wind is from 165 degrees and pushing us along in moderate following seas. Our ride is now considerably smoother than earlier, today. We did pass through some ice between 1200 and 1300 UTC. The sea is clear now. We are headed for Cape Town, South Africa. This is the safest and most expedient course for us. We thank those who have expressed concern and good wishes. We are, of course, very, very disappointed. We are slowed, but safe. February 1, 2018, 1300 UTC: Our ship is still at anchor off the east side of Bouvet. Winds are 35 to 40 knots, and the ship is pitching and rolling up to 30 degrees. This makes flying and a landing attempt impossible today. The temperature is hovering at around 0 degrees C. Visibility has improved. We are poised and ready when a weather window opens. We had our maritime mobile station up for a few hours, but had to take it down again to avoid damage caused by the extreme motion of the ship. 1445 UTC: Winds have increased to 45 knots. Unsecured items are again sliding across floors and tables. Some team members are again feeling seasick. The barometer has risen, slightly. We are anxiously awaiting calmer conditions. 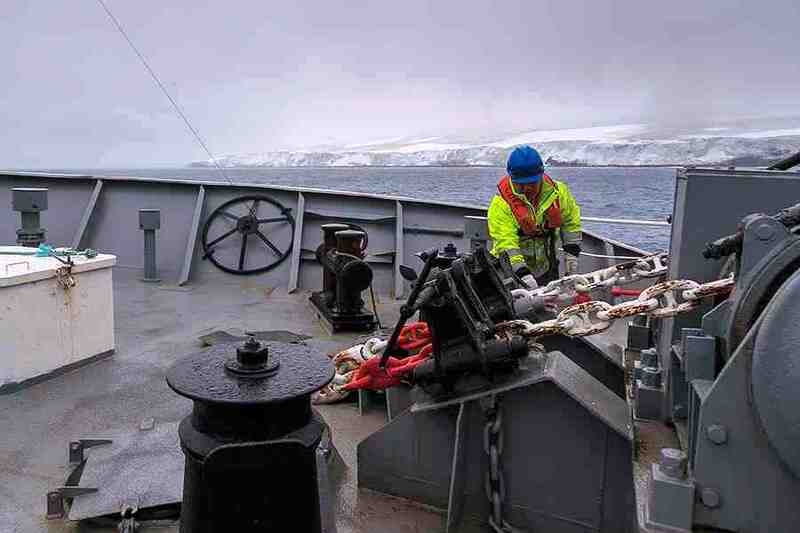 A member of the Betanzos crew drops the anchor a half mile off the east coast of Bouvet Island. Yesterday’s weather did not permit helicopter flights to the island. 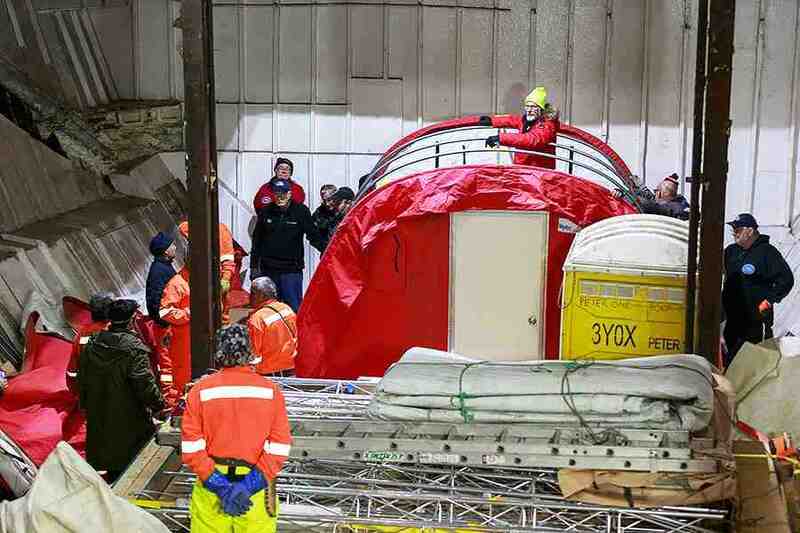 The 3YØZ team used this time to check out the shelter components, and they erected one of the 10 ft x 12 ft shelters in the spacious hold of the Betanzos. Zoomed closeup of the foreboding wall of glacial ice. 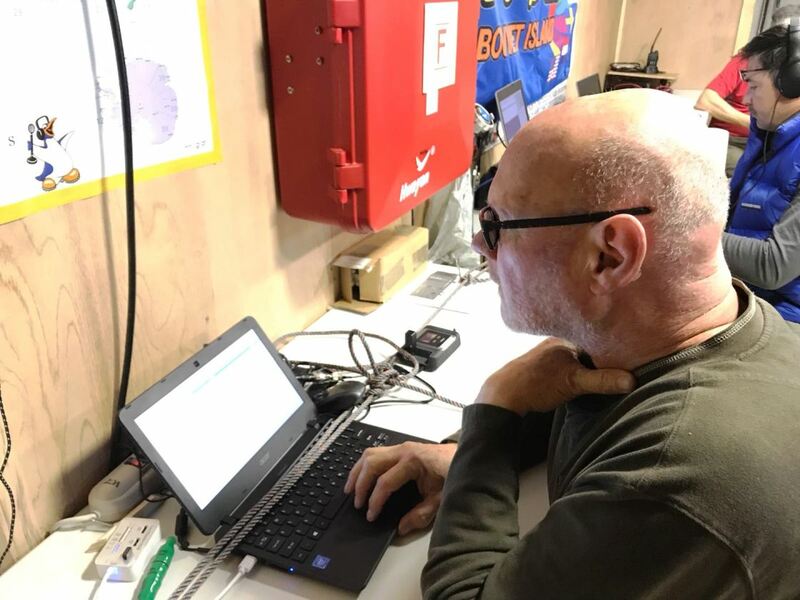 With a dream that began 10 years ago and after 3 years of intense planning and preparation 3YØZ team leader Ralph Fedor, KØIR sights Bouvet Island at approximately 0600 UTC on January 31, 2018. January 31, 2018, 0830 UTC: Bouvet Island came into view at about 0600 UTC today. We dropped anchor at 0810 UTC in approximately 25 meters of water off the east side of the island between Kapp Meteor and Swarthamaren. The temperature is 2 degrees Centigrade. Thirty five knot winds are blowing out of the northeast with a driving rain. Visibility and ceiling are estimated at 1 mile and 500 feet, respectively. We are poised and ready when our weather window arrives. Our first strike team, selecting and securing a site, will be EY8MM, KØIR and Alejo Contreras (Chilean Antarctic explorer, guide and mountaineer). Thick, dense fog and cold freezing rain greet us at our arrival… Now the team must clear the next hurdle- getting onto this glacier and setting up our camp. January 30, 2018, 1130 UTC: Our current position is 54 degrees 27 minutes South; 1 degree 68 minutes West. The outside temperature is 4 degrees C with 10 knot northwest winds. The sea is gently rolling with scattered icebergs visible on radar. Visibility is approximately 1/4 mile in moderate fog. We are roughly 20 hours from Bouvet. Today, we will have our final team meeting and discuss safety, loading sequences, camp development and layout, infrastructure on island vs. the number of people on the island, emergency contingencies and team assignments. The local weather forecast for Bouvet is questionable for a landing to occur tomorrow. Hopefully, we can at least establish an anchorage, and be fully prepared to commence our operation at the first weather window. 2200 UTC: We are less than 100 miles from Bouvet in moderate seas and visibility of about 100 meters. Scattered icebergs remain on radar. 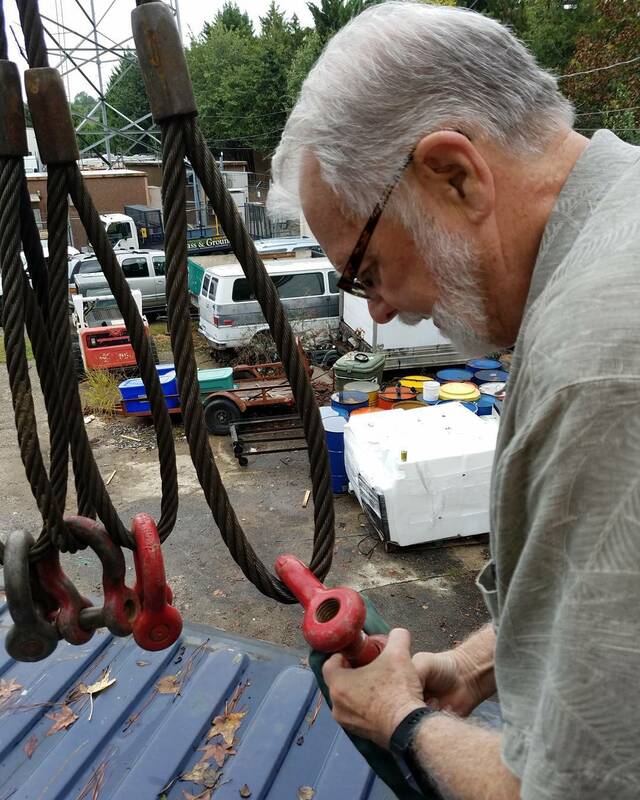 Today, we removed most of the contents of our sea containers, re-sorted and staged it, and then put it all back in the containers, again, before a light rain started. We hope to be anchored shortly after daybreak tomorrow, and will anxiously await a weather window that will allow us to start our landing operation. We are ready whenever Mother Nature gives us the green light. January 29, 2018, 0800 UTC: We had another night of rocking and rolling. A strong southwesterly wind produced high following seas resulting in the stern of the ship rising on the approaching wave or swell, the ship surfing down the front of the wave, and the bow plunging into the wave ahead of it. The change in motion produced a change in the migratory pattern of gear and furniture, but the chaotic end results were similar to our last rough ride. Entropy exists. Last evening, we met with the helicopter pilots to be sure we understood each other. Safety first, and then get everything ashore as quickly as possible with never more people than our infrastructure can support. We parted with the “one team” commitment. We continue to bounce around, but for the soaring sea birds around us, it is just another day. 1605 UTC: Satellite navigation shows the ship 370 nautical miles from Bouvet. Last night, we met with the helicopter pilots to discuss our landing procedure. 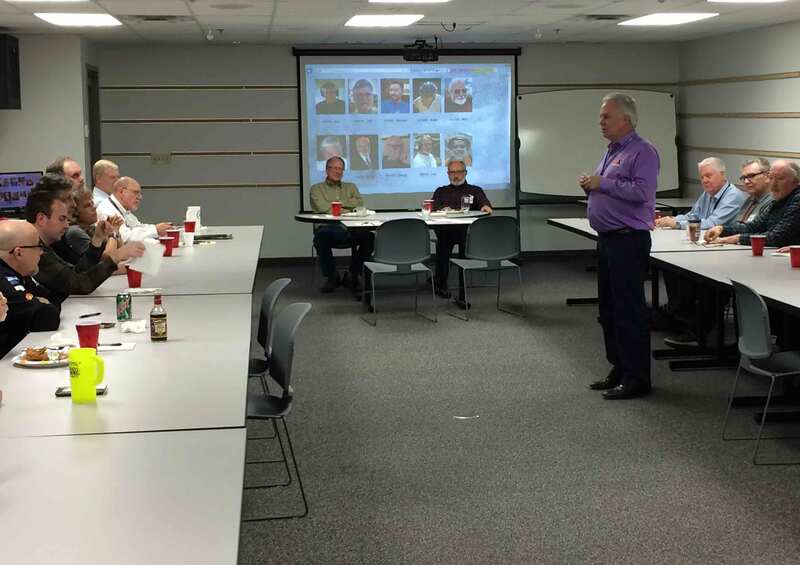 Meeting discussions included: Helicopter sling and interior wind speed limits, weight limits and dimension limits. Cargo loading procedures were discussed. Helicopter refueling protocols were outlined. January 28, 2018, 1200 UTC: 54 degrees 30 minutes South; 14 degrees 54 minutes West. The seas have calmed somewhat. The predominant motion of the ship remains a moderate roll. We have not restored our maritime mobile stations, due to difficulty in securing the equipment to prevent damage. There are occasional breaks in an overcast sky. Visibility is estimated at 15 to 20 miles. Our current forward speed is 8.8 knots; a compromise between creature comfort and structural stresses and getting to Bouvet. Attendance at breakfast this morning was sparse, with most team members preferring their bunks over caloric intake. N9TK, N4GRN, and KØIR continued working on flight sequencing last night, and should complete the process this evening. We have a lot of “stuff” to get ashore as fast as possible in the weather windows Mother Nature sees fit to give us. Our forecast is for moderate snow ahead, followed by clearing. 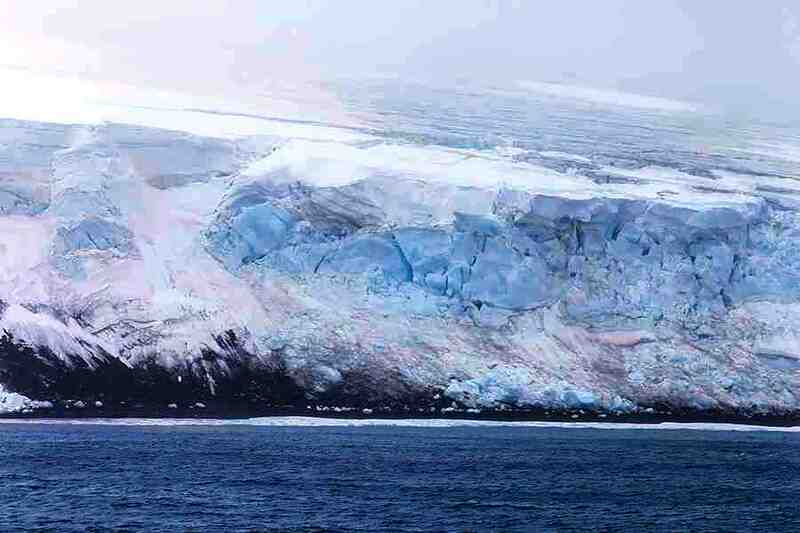 Icebergs remain visible but have decreased in number. 1520 UTC: Satellite navigation shows the ship 623 nautical miles from Bouvet. The 3G9A/MM radios before the storm. The 3G9A/MM radios during the storm. Glenn, WØGJ tries to deal with the rough seas. The TV lounge before the storm. 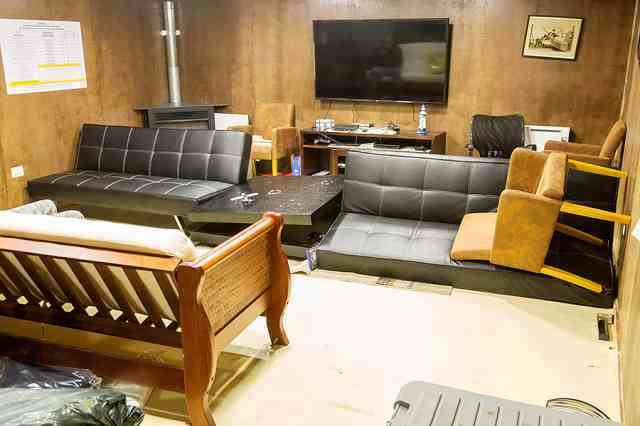 The TV lounge after the storm. 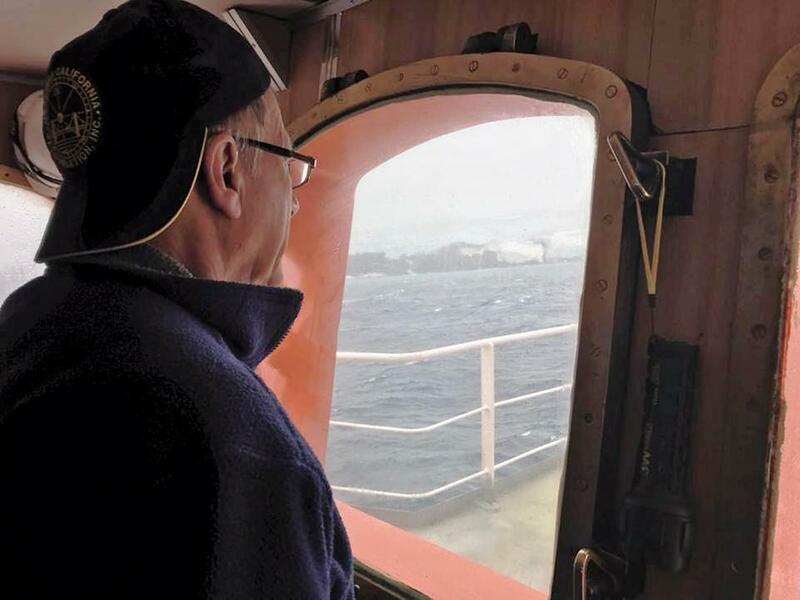 Pista, HA5AO ponders what’s in store on Bouvet. The conference area before the storm. The conference area after the storm. 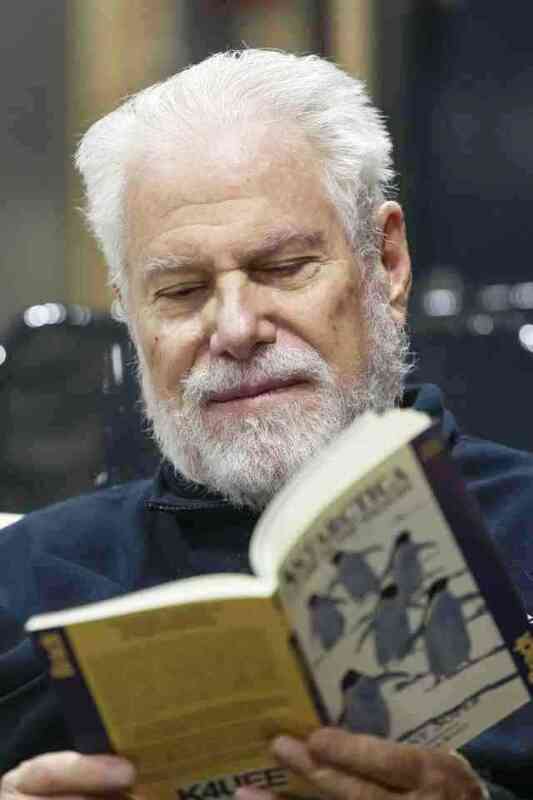 Arnie, N6HC reads a book on Antarctic birds to help keep his mind off of the rockin’ and rollin’. January 27, 2018, 0530 UTC: Last night was a tough night for us. The full fury of the South Atlantic was unleashed upon us. Shifting winds and turbulent seas changed our ship’s motion from severe pitching to pitching and yawing to very marked rolls. That which was not secured is no longer where it was. Some of those who were up and about yesterday are down and out today. Personal items are scattered, and some small items are lost in the mix. Bathroom floors are wet from water splashing out of the toilet bowls. It was a tough night, but we knew this was likely when we signed on. We will persist and continue towards Bouvet. Saturday, January 27, 0120 UTC: Thursday night, our weather took a major turn for the worse, as we were overtaken by a low pressure system with winds about 35 knots and confused seas at 5 meters. The ship has been pitching quite a lot, but is riding well. 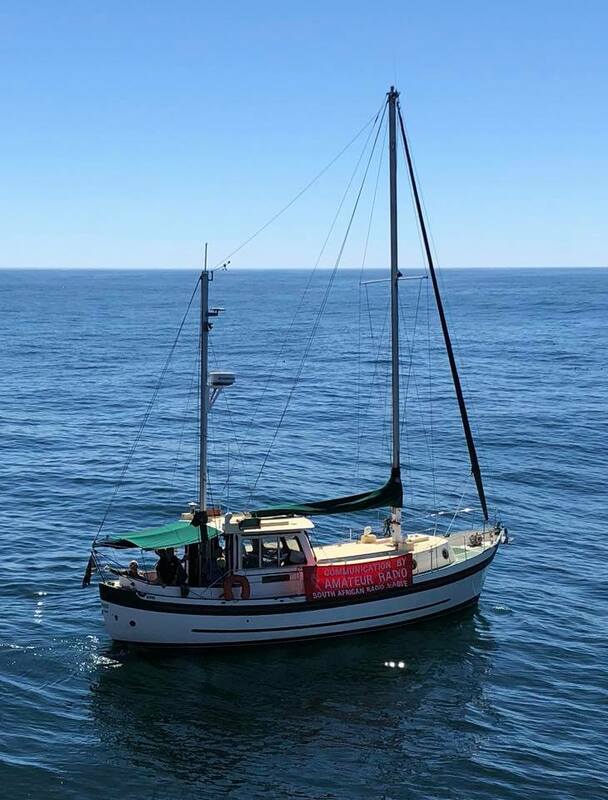 This short video courtesy of Jeff, NM1Y best tells the story of our day, yesterday, and why we have remained below decks (click on video at the left). We had to QRT our maritime mobile operation and secure the radios, because of the ship’s rolling. We did not want to risk damage to the radios. We have yet to ascertain the status of our ship-mounted antennas for possible damage. The Hustler vertical is mounted on the bow, and took many salt water baths yesterday (as you can see in Jeff’s video). Today’s forecast looks a little better. We hope to be back at full speed, and have 3G9A/MM QRV again, after checking and repairing the antennas. January 26, 2018, 0945 UTC: The forecast for worsening weather was accurate. 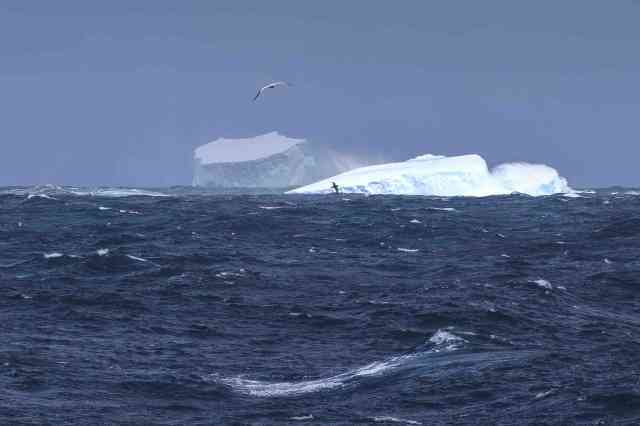 The seas are an estimated 15 to 20 feet, and we are in heavy snow, as we continue toward Bouvet. There will be fewer of us at breakfast this morning. 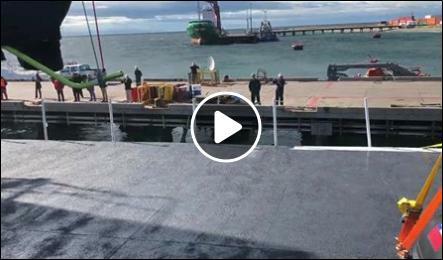 Yesterday afternoon, the team and ship’s crew moved our rod anchors, T-post anchors and the DX Engineering antenna masts to the rear of the ship for faster access during landing operations. This was a good thing, since these operations would not be possible today. Last night, N4GRN, N9TK and KØIR began planning the loading and sequencing of helicopter flights to the island. 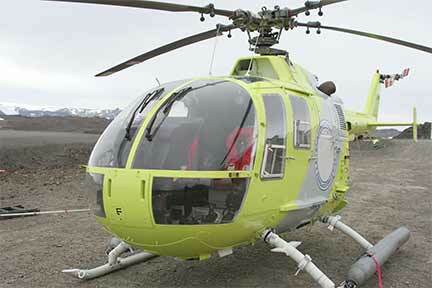 We plan to run one helicopter with only sling loads and one with only interior loads and passengers. One aircraft can operate off of the rear helicopter pad and one off the hanger deck. Today, we will continue to work on load sequencing, and continue our packing and re-packing of the personal gear we will each take to the island. The landing process will focus on safety and building of our infrastructure, so that it can support the number of people on the island at any given time. 1600 UTC: We are slowly being overtaken by a deep low pressure system moving from west to east. Strong southerly winds are producing a mixed-up and angry sea. This has slowed our forward speed to 2 knots. We should be out of this system around 2300 UTC tonight. That’s the good news. The bad news is that there is another low right behind this one, although it is not as deep. 2200 UTC: We are still rocking and rolling, but sea conditions have improved since my earlier post. We had to take our stations off line, as equipment was not staying on the tables. Precipitation has stopped. We’ve been able to increase our speed to 8 knots. Attendance at dinner was down, but better than expected. January 25, 2018, 2100 UTC: Today, the seas remained relatively calm, but the temperature has dropped significantly, and the wind velocity is increasing. We passed another iceberg today. The weather is supposed to deteriorate tomorrow. We spent the day moving our anchorage systems and support masts from the cargo hold to an area closer to our helicopter staging area, hoping to make our loading and flights to the island more efficient and faster. Propagation is becoming closer to that predicted in our model. Once we are on the island and have better antennas with no noise, we expect we will hear much better. Right now, signals are fairly weak, but definitely there under some local noise from the ship. After tomorrow, it looks like the weather will calm a bit. We are hopeful this will coincide with our arrival time at Bouvet. We are well past the half-way point of our voyage. Our first iceberg was sighted today about 100 miles southeast of South Georgia. Craig, K9CT helps Hawk, SM5AQD and Arnie, N6HC master the Flex Maestro. Jeff – NM1Y, Nodir – EY8MM and Michael – PA5M with South Georgia in the background. 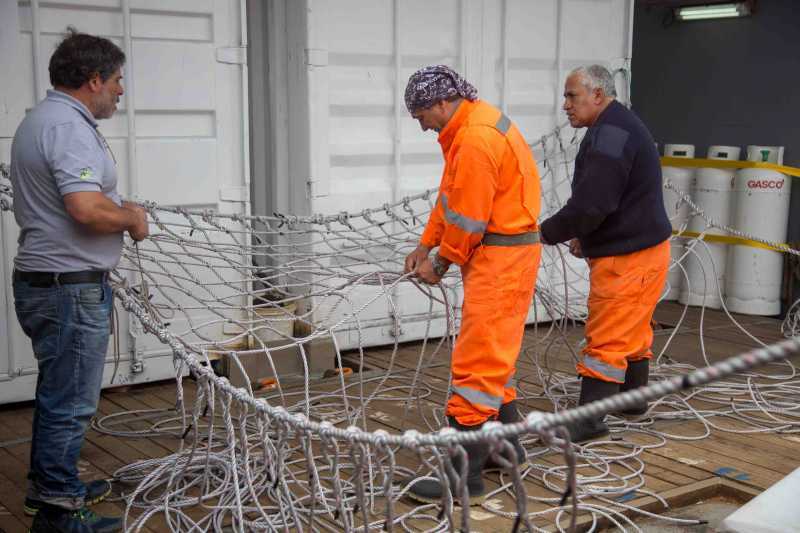 Crew members of the Betanzos making progress building nets that will be used for helicopter sling loads. January 23, 2018: As many of you may know, today was Nodir, EY8MM’s birthday. Nodir wants to pass along his thanks to all his DX friends who have sent him Happy Birthday wishes. An impromptu birthday party was held in Nodir’s honor. The Betanzos’ cook, Alejandro, whipped up an amazingly delicious birthday cheesecake! Below, are photos to give you an idea of our daily routine on the ship. Gregg, W6IZT checks his email using the Inmarsat system. Team Leader Ralph, KØIR leads a discussion at the daily team meeting. 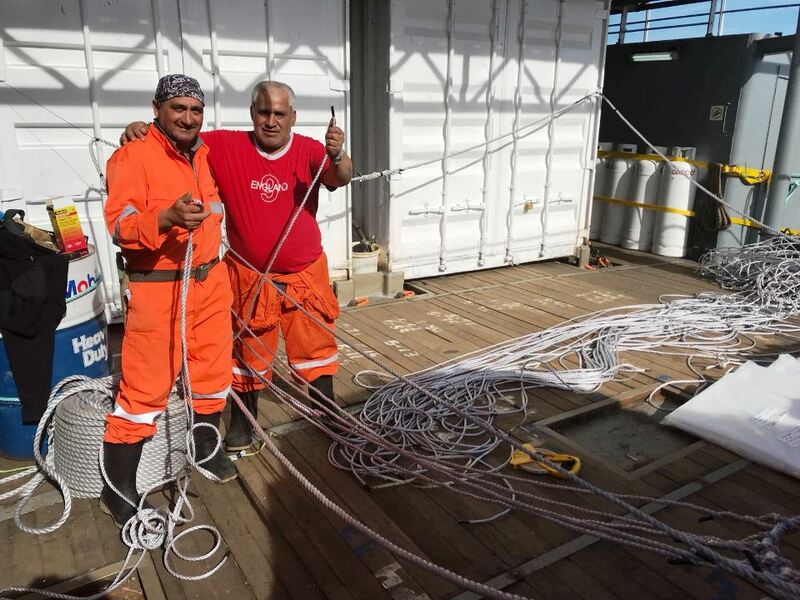 Members of the Betanzos crew are making the rope slings which will be used by the helicopters to move equipment and supplies onto the island. Craig, K9CT gives a tutorial to the 3YØZ team on operation of the Flex 6500. Bob, K4UEE is QRV as 3G9A/MM. 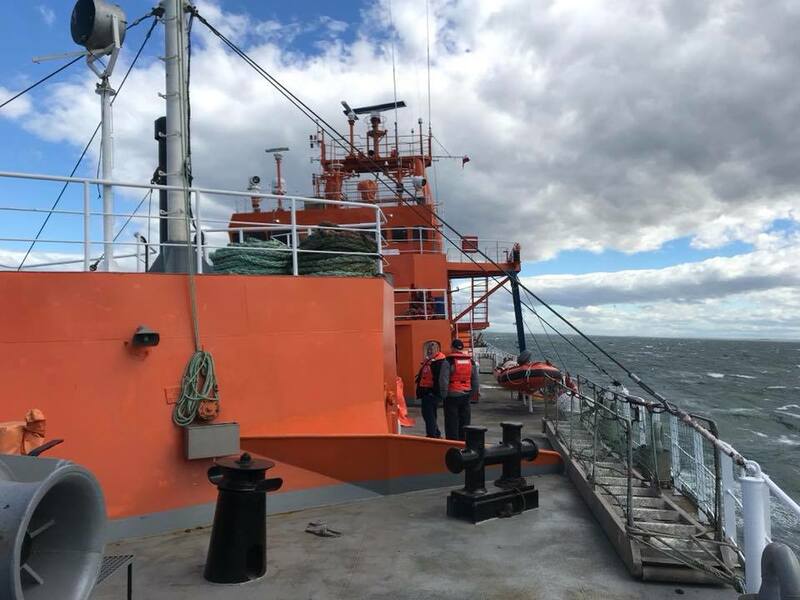 Jamuary 20, 2018: We had an uneventful traverse of the Straits of Maglellan, and are currently just southeast of the Falkland Islands, making approximately 11 knots. At the moment, we have fair winds and following seas, and our weather forecast looks good for the next 12 hours. However, the weather can change quickly in this part of the world. Our team is in good spirits, but one or two are feeling the effects of moderate seasickness. We have one maritime mobile station active, with most of our QSOs on 20 and 40m. We are running 100 watts to a Hustler vertical on the bow of the ship and an OCF dipole hung from the bridge area. Our transmissions include grid square information. We hope to add a second station, soon. Michael, PA5M (with binoculars) tries to sight the Falkland Islands as Jim, N9TK waits for his turn. On the Way to Bouvet! Jan 19, 2018: The M/V Betanzos pulled away from the Puntas Arenas pier today at 1240z, with 20 happy and excited 3YØZ operators on board. Tug boats were summoned for help, due to very strong winds and rough seas that were holding the ship against the pier. Now, it’s full speed ahead to Bouvet! Listen for 3G9A/MM during their voyage. January 16, 2018: Preparation for departure continues, albeit at a somewhat slower pace than hoped. 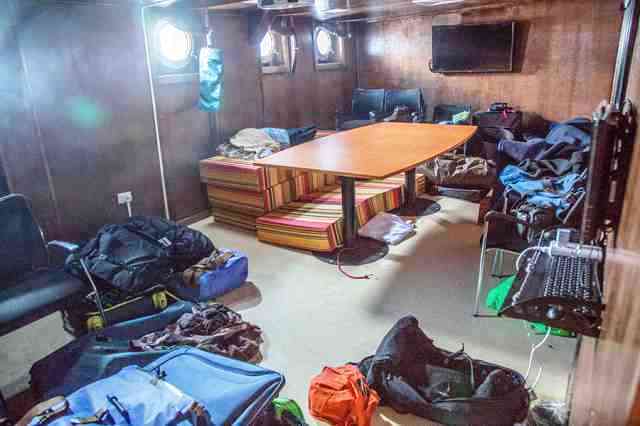 However, the vessel is now fully fueled, and all of the DXpedition gear, food and medical and survival gear is aboard. And, you have likely read that team members completed their cold water survival, CPR and fire-fighting training. 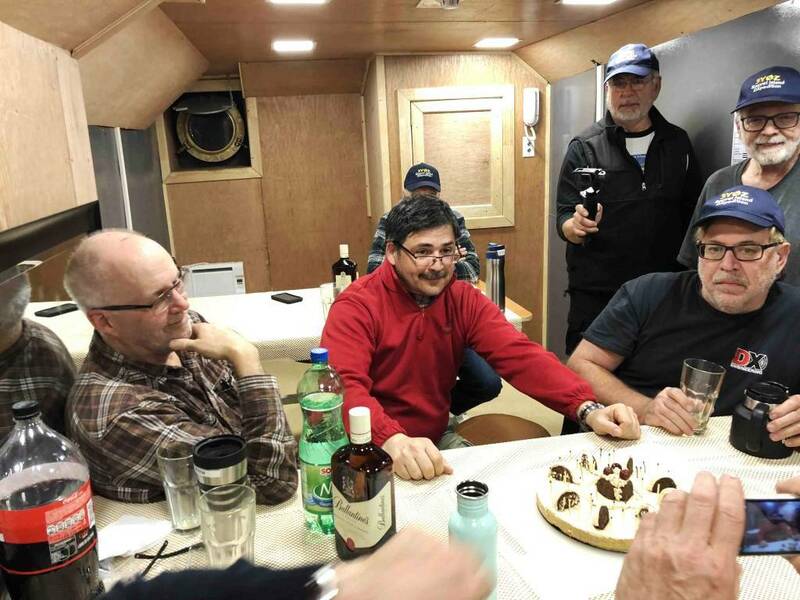 Two team leaders and our merchant marine captain team member (W7IV) have been aboard the vessel. They observed the crew and contractors working hard to complete their projects. 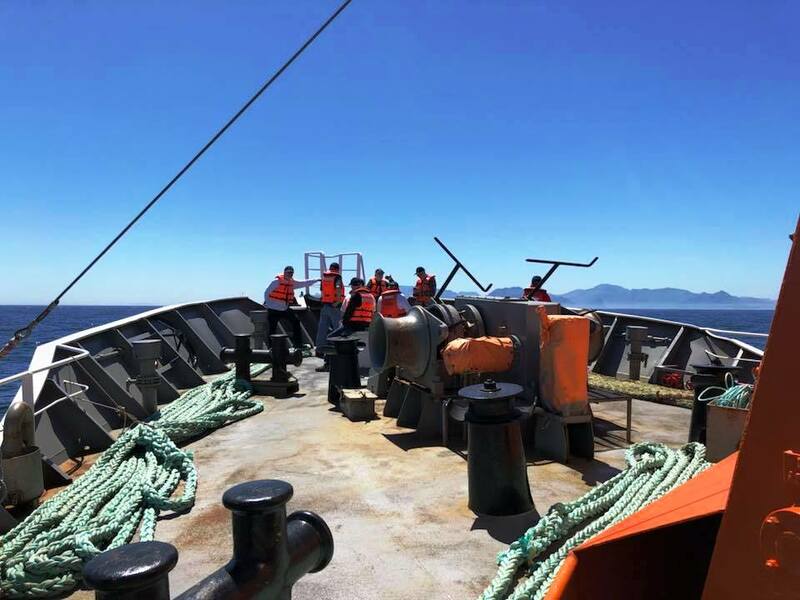 Now awaiting final clearance to sail, which will be issued by the Chilean Navy – the regulatory authority for maritime safety. We remain confident in our success, and are anxiously waiting to get underway. Whatever further delay we encounter will not impact our results on the island. Preparing to cast off from Punta Arenas! Jan 13, 2018: The 3YØZ team is ready to sail to Bouvet! 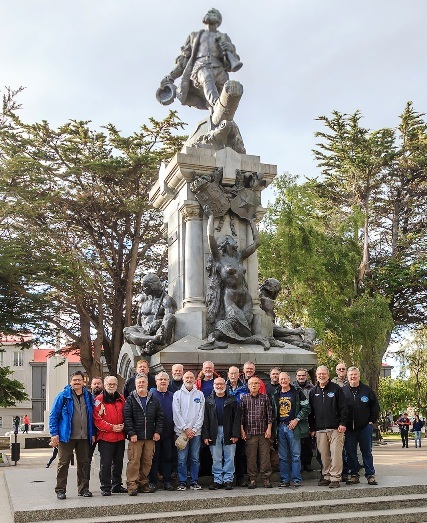 Here, they are gathered at the statue of Ferdinand Magellan in Punta Arenas, Chile. Press Release #11 has been posted. Click on the “Press Releases” box above, right to read the latest news. 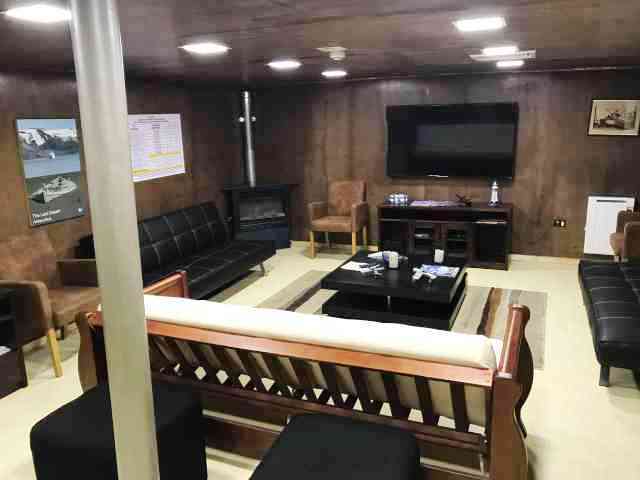 NOTE: The 3YØZ team will be active as 3G9A/MM during their voyage aboard the MV Betanzos to and from Bouvet. Dec. 28, 2017: Here she is, the Betanzos, the ship on which we will begin our journey to Bouvet in just over two weeks. It’s been a busy year for this vessel. She’s been pulled from the water, inspected, refurbished and remodeled stem to stern to prepare her for new life as an Antarctic support vessel, and for our expedition to Bouvet. During her previous life in commercial fishing, she was at sea for months at a time. Her captain of 8 years is still with her, and knows the Southern Ocean, the ice and his ship very well. Beneath that new coat of paint lies a rugged vessel manned by an able crew. We’ll climb aboard on January 13, 2018 to begin our voyage to Bouvet. Help us by some flying time. Remember to include your name and call sign. Helicopters are at once our wings and our Achilles’ heel; a godsend for safety and access to the best operating site on Bouvet, but devilishly expensive to operate. They are essential to our success, safety and making lots of QSOs from Bouvet. 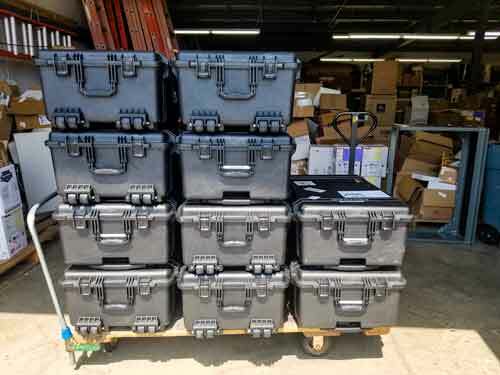 The more gear they can bring ashore, the more contacts we can make. Therefore, helicopters directly impact the number of all time new contacts we will deliver to you, the number of new band modes we can give you and the overall number of contacts we make. 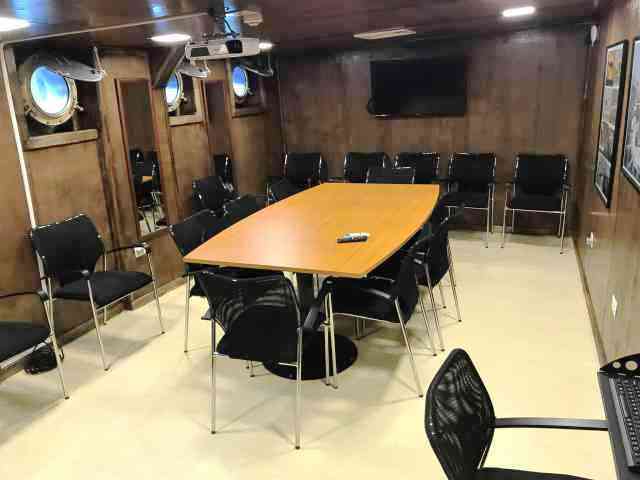 Our team members will underwrite the cost of getting all of the basic and essential equipment ashore to enable us to do a good job on this DXpedition. Whatever this costs us, we will do it. However, to do a great job and get ashore two antennas for every band, adequate fuel and generators for full power 24/7, an amp on every radio and a second shelter for operating, we must dig a little deeper to pay for those extra flying hours. If you can help us buy a few more hours of flying time, we will have doing the best job possible firmly within our grasp. Please consider clicking the button on the left to buy us some time. Dec. 21, 2017: Thank you!! Many of you have stepped up to help us buy those additional hours of helicopter time. We have a ways to go, but with your added support, we are making progress. Dec. 20, 2017: When operating on a DXpedition, you like certain information at your fingertips: great circle bearings, population information, propagation data, sunrise and sunset times, important frequencies, and helpful tips. Phil, W9IXX, has compiled this data for us and placed it on a double-sided laminated sheet. Phil has done this for us in that past, and we once again thank him for his time and talents. Click on the Twitter icon at the top right of this page to see these sheets and lots of other information. 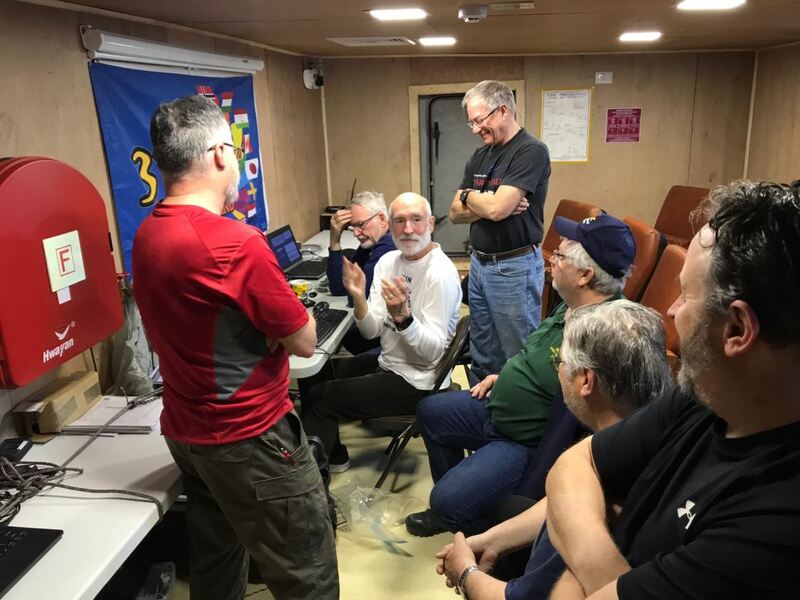 Dec. 16, 2017: The Bouvet Island DXpedition team has been very busy. In the last week we’ve had Skype conference calls with the CEO of our transportation company and with the captain of our ship. We can report that everything we can control is under control. Our sea container is in Punta Arenas, and should be moving out of customs bond or may have already done so. 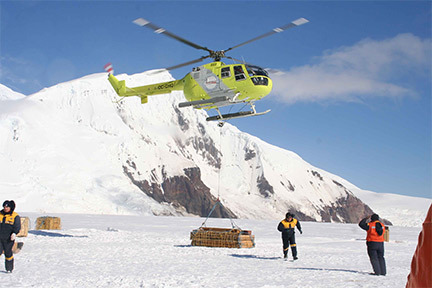 We are gathering some additional last minute supplies to take as extra baggage, including ice screws, should we find ourselves camping on re-frozen melt areas on the glacier. We have finalized our shelter layouts, fuel calculations, maritime mobile antenna plans, and have assigned some duties relating to flight and cargo staging. The team members will all be taking a formal marine safety course before embarking. 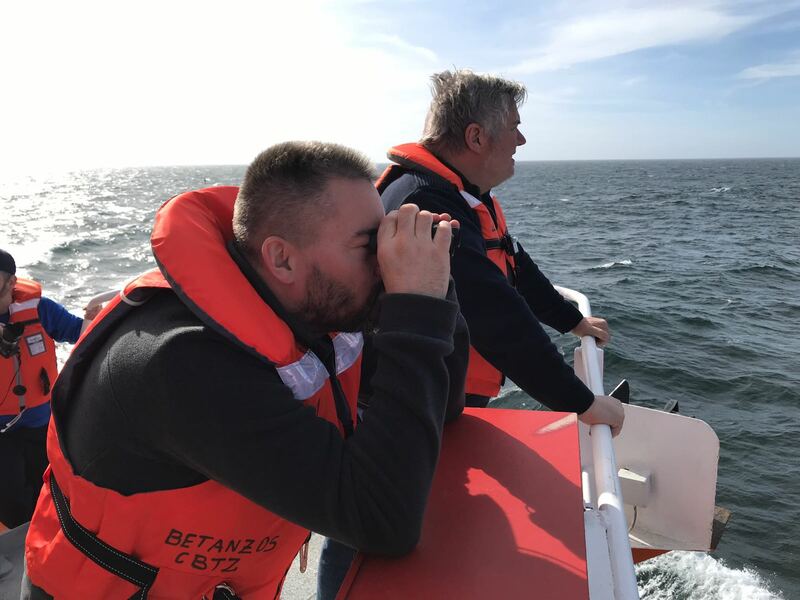 Neither our transportation company nor the ship’s captain expressed any worries or concerns over the recent seismic activity near Bouvet. And yes, we are still struggling with he helicopter flying hours issue. See below. Nov. 22, 2017: Our sea container should now be between the ports of San Antonio, Chile and its destination, Punta Arenas, Chile. The logistics have at times been confounding, but we are actually ahead of schedule with our shipping. We have our license and callsign for our maritime mobile operation on the way to Bouvet. One of the problems with shipboard operation is static charge build up on antennas from the winds and precipitation. This is a particular problem with antennas that are not at DC ground. Having a transceiver exposed to this hazard can be disastrous for the radio. We are aware of the issue, and are instituting ways of dealing with this threat. Our band plan is now posted on this website. The most recent propagation predictions continue to support the patterns shown in the videos on our propagation page. FT8 adds a new dimension to DXpeditions. We will use this mode, but not as a PRIMARY mode. 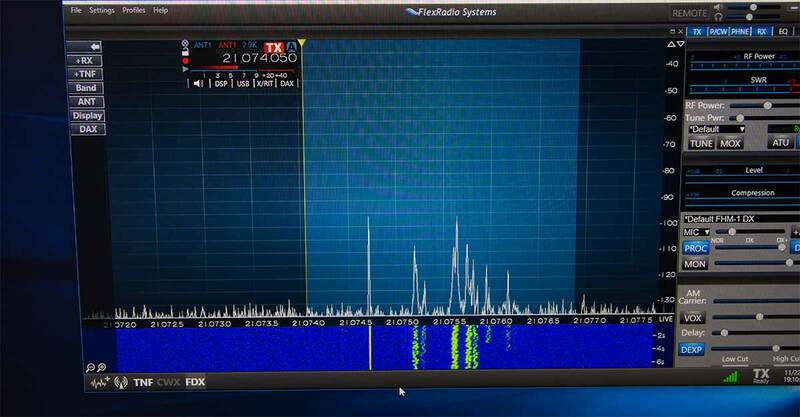 We will only use FT8 when we cannot use the standard, higher rate modes. We have outlined our FT8 operating plan on the Band Plan page of this website. Please visit this page, if you intend to try contacting 3YØZ on FT8. It is “must” reading. 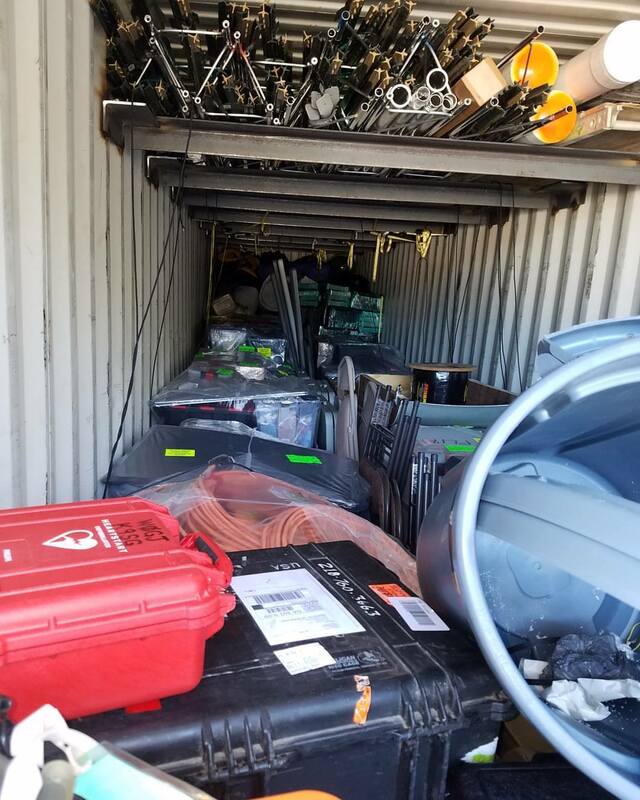 Oct. 10, 2017: OUR SEA CONTAINER IS PACKED!! 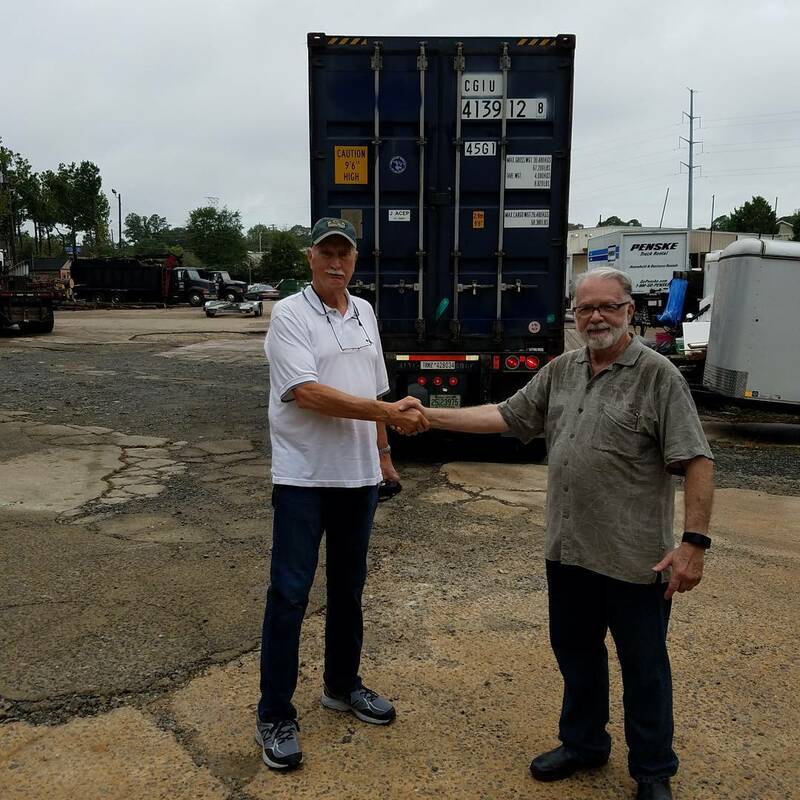 After weeks of inventorying, packing, padding and weighing supplies and equipment, we have sealed our container and loaded it aboard a truck bound for the port of Savannah. The container will go by sea to Manzanillo, Mexico; by rail to Balboa, Panama; then by sea to San Antonio, Chile; Copihue, Chile; and finally Punta Arenas, Chile. The contents will be taken aboard our ship in Punta Arenas, and meet our team at King George Island in the South Shetlands on January 13, 2018. George, N4GRN closing a shackle. Gregg, W6IZT tensioning a line to the crane. 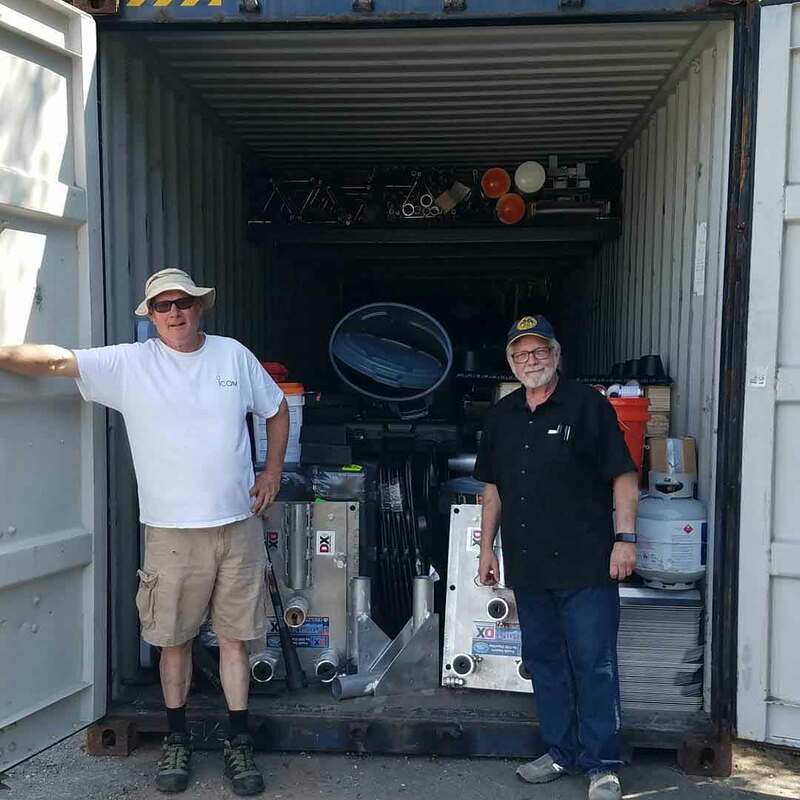 Bob, K4UEE and George, N4GRN with the container loaded and on its way. 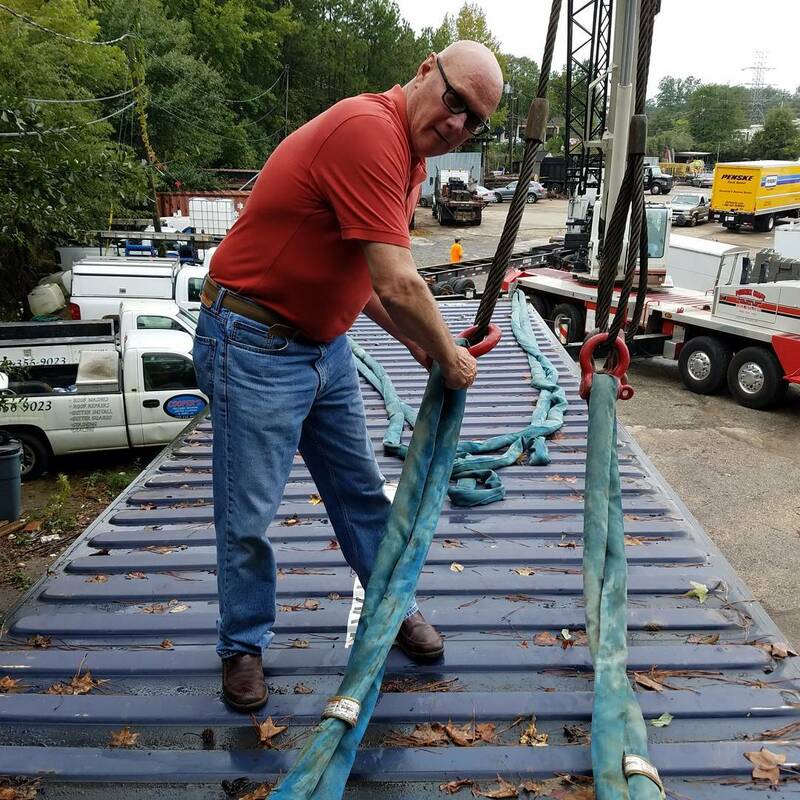 Sept. 30, 2017: Our sea container is 95%+ inventoried, packed and documented for customs. Two items are scheduled to go into it by midweek, and then the container is off to Chile, where we will meet it in January. Gregg, W6IZT and George, N4GRN did an enormous amount of work to accomplish this, and are shown here. 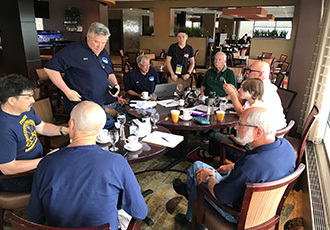 Sept. 7 – 10, 2017: 18 of our 20 team members from 6 nations assembled in Atlanta, GA for planning meetings, safety briefings, equipment packing, inventorying, container packing and getting to know each other. It was a very successful weekend for us. A highlight was testing our 2 meter EME setup. It worked! We completed a QSO with our pilot, PA2CHR. Tilt-up base units for our falling derrick masts and a stack of snow anchors from DX Engineering. Team leaders K4UEE, KØIR and LA6VM. Generators are being tested and run up behind them. We assembled and tested our 2 meter EME station during this exercise and worked PA2CHR. 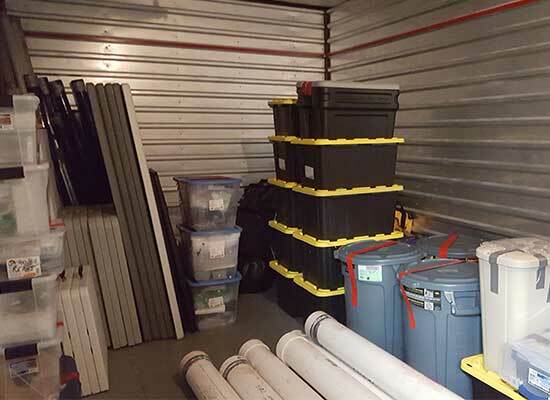 A small fraction of our equipment being packed and inventoried in one of our storage areas. 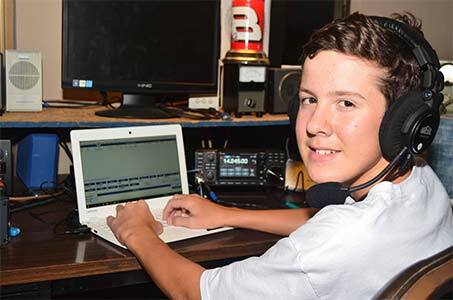 Sept. 6, 2017: Meet Bryant, KG5HVO our 13-year old Youth Pilot, who found amateur radio through the Boy Scouts. He’s an avid DXer, a 35 WPM CW contester, a CWops member and was a member of the 2017 Dave Kalter Youth DX Adventure to Costa Rica. 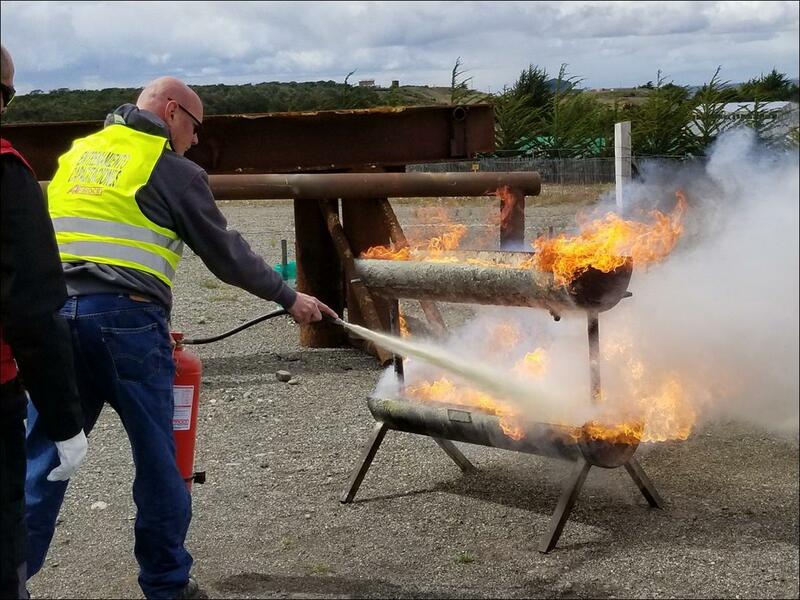 He’s on fire to fulfill his role in the Bouvet Island DXpedition, and we are excited to have him on our Off Island Team. Welcome Bryant! 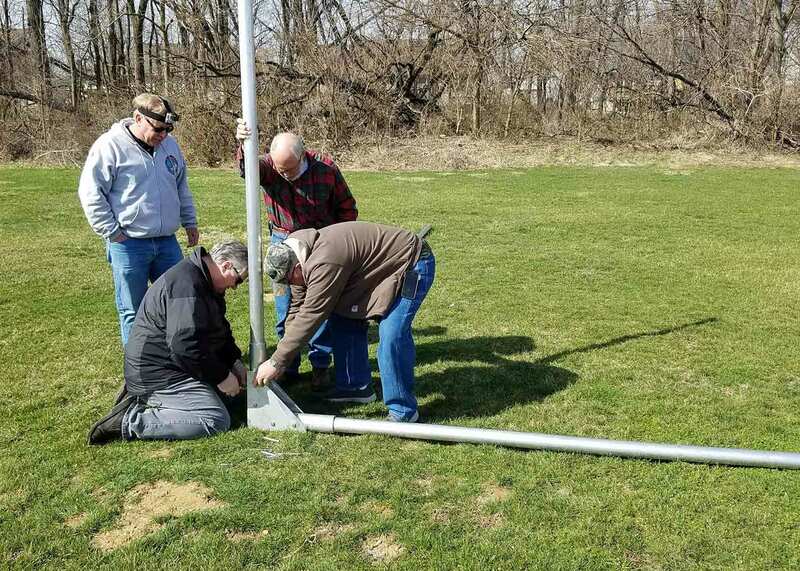 Aug. 27, 2017: Our team would like to publicly recognize and thank Stan, K5GO (and his grandson, Lawrence) for all of their help designing and building our DXpedition Yagi antennas. We used his antennas on Amsterdam, FT5ZM, and found them to be an incredible asset for us and for you the DXer on the other end. Thank you, Stan! Aug. 25, 2017: We are proud to show you our Bouvet Island DXpedition 160 meter vertical antenna. The antenna was designed by EY8MM and DX Engineering, and fabricated by the DX Engineering staff. It is a 90-foot beauty, consisting of 70 feet of aluminum tower section and a 20-foot stinger on top. 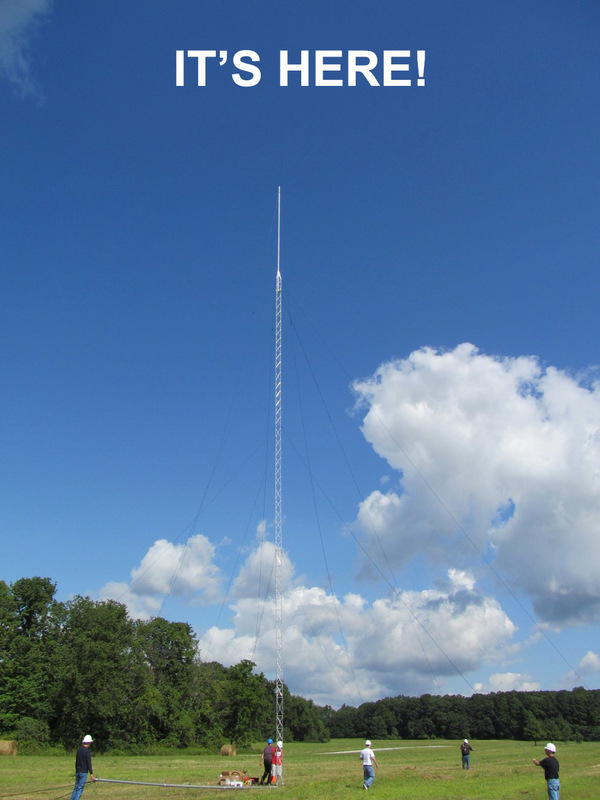 It is top loaded, tuned with two base coils, and raised with a 40-foot falling derrick. The VSWR at 1.825 MHz is 1:1.0, rising to 1:1.7 at 1880. 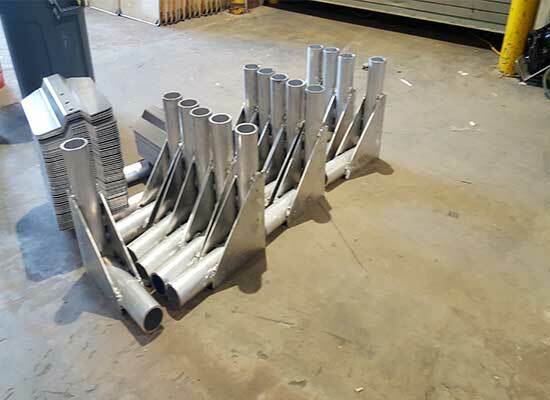 We have the radials pre-cut, spooled up and ready to install. 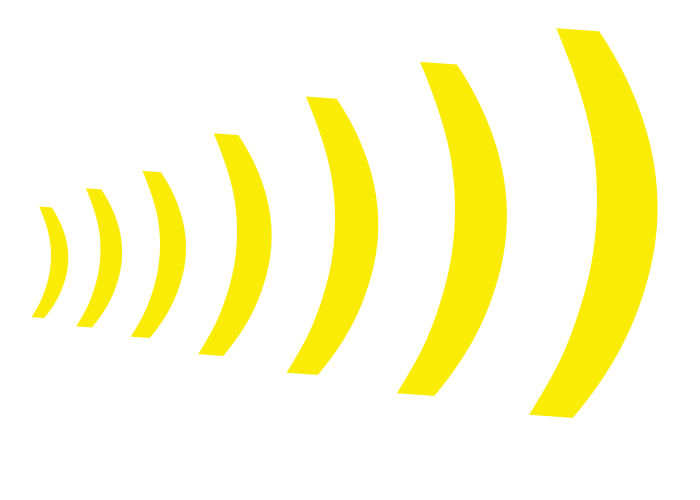 When we couple this transmit antenna with our directional receive antennas, you should be able to hear us, and we should be able to hear you. SEE YOU ON 160 FROM BOUVET! Aug. 23, 2017: None of us are immune from family medical and health issues. 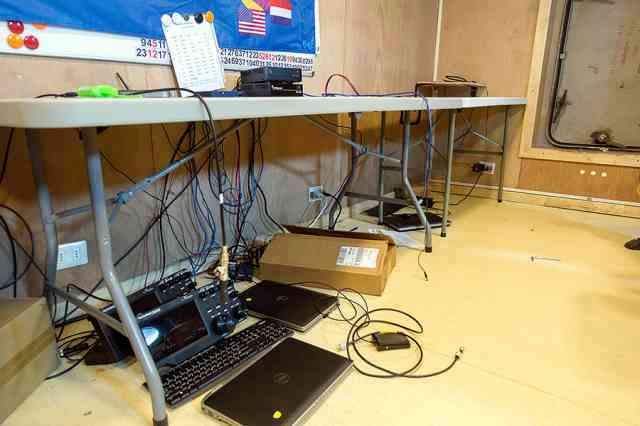 Unfortunately, Neil – VA7DX, faces this issue and had to withdraw from our DXpedition team. We will miss his skills and wit. Keith – VE7KW, will be taking Neil’s place. 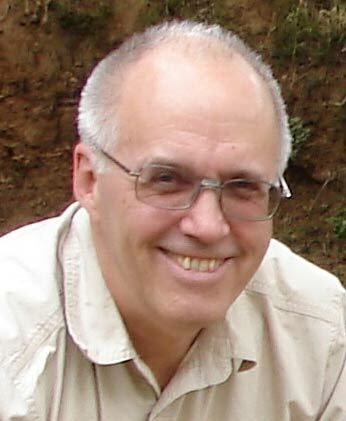 Keith brings DXpedition, contesting, and foul weather experience to our group and is a retired electrical engineer. We welcome Keith to our team. 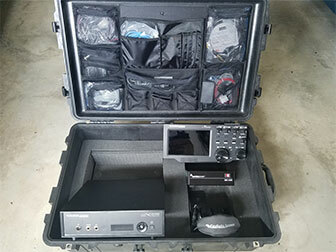 Aug. 18, 2017: Ten more Flex stations arrived at K9CT’s QTH, each packed in its own Pelican case and including a power supply, a 6500 or 6700 Flex radio, a Maestro, a RadioSport headset, and necessary wires and cables. We will have a total of 14 stations, all of which will be teamed with its computer and tested on our network. When complete, the stations will be shipped to Atlanta for packaging in our shipping container. Two stations will be set up at our Atlanta team meeting during Sept. 7 to Sept. 10. August 4, 2017 was a really big day for us. We learned that the Northern California DX Foundation directors voted to contribute $100,000 to our DXpedition. This represents the largest DXpedition contribution ever made by the NCDXF. We as a team will do all that we can to be worthy of that degree of trust and that level of support. 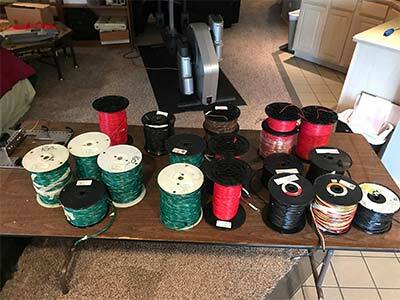 Aug. 4, 2017: How much radial wire does a DXpedition need? 3YØZ needs quite a bit. 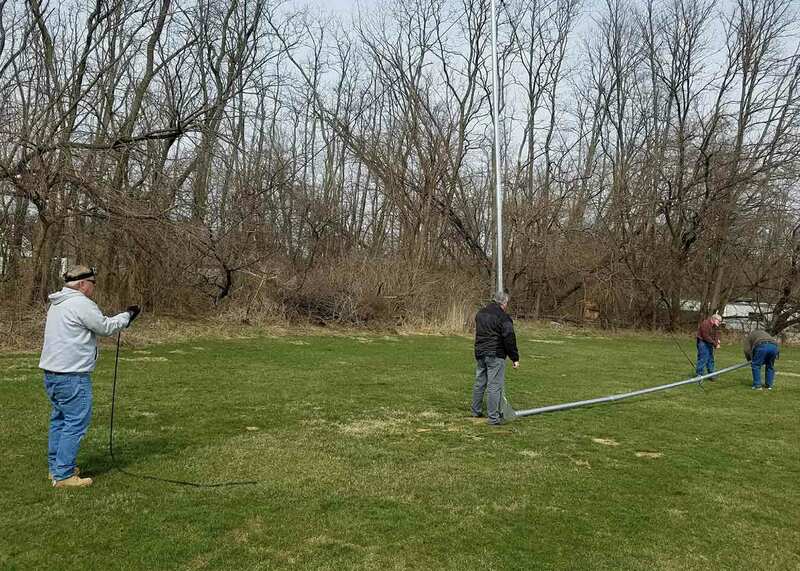 We have a single vertical for 160, two verticals for 80, a single vertical for 60, a 4-square and a single vertical for 40, and a vertical for 30 meters. Jim, N9TK, has been busy pre-cutting radial wire for all these antennas and placing the cut sections on spools. The spooled up wire you see in the photo to the left totals over 24,000 ft. We’ll spread these radials over the ice on Bouvet with the hopes of being loud and easy for you to work. Thanks for all your effort, Jim. July 29, 2017: We regret losing our team member, Andy, UA3AB. We have traveled with Andy previously, and regret he cannot join us this time. Andy cannot be away from home for an extended period of time and be unable to return home in the event of an emergency. Our friend, Hawk, SM5AQD will be joining our team. Hawk’s personality, experience and work ethic will blend beautifully with our team. 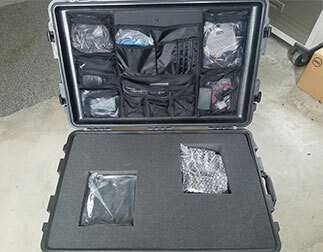 FLEX Station #1 packed and ready. July 26, 2017: We are happy to have the support of the DX’ers of Turkey. 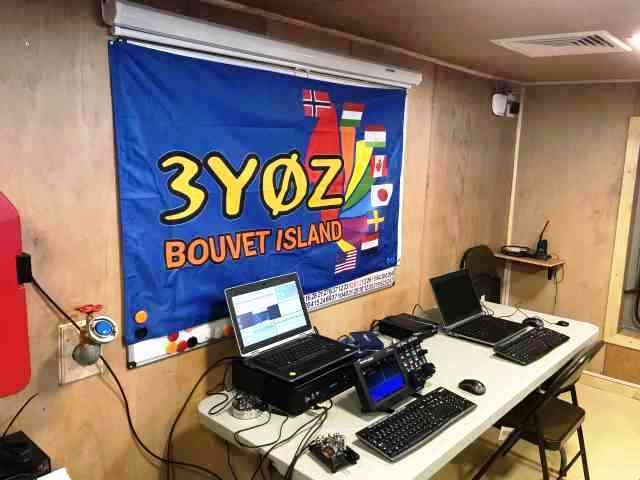 They have published a very nice website about Bouvet and our DXpedition. Click the image at the left to visit the site. Our thanks to the hams of Turkey. See you in our log! 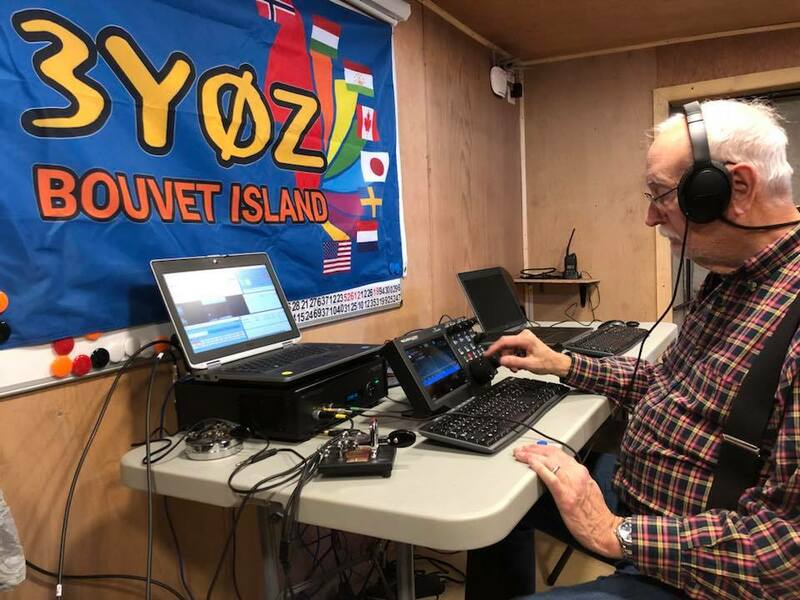 July 22, 2017: More DX clubs and organizations are “Stepping It Up,” increasing their support of the Bouvet Island DXpedition with second contributions. 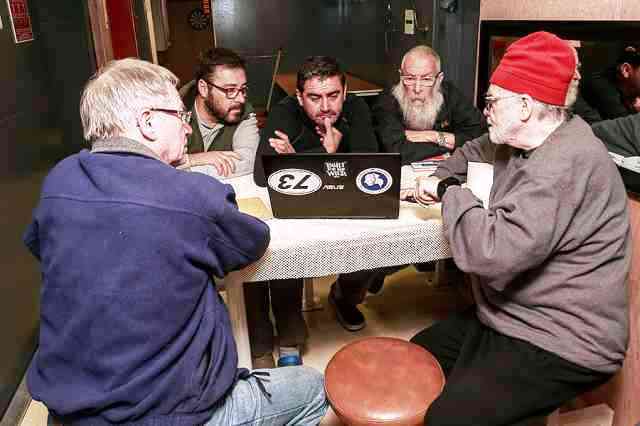 Additional contributions have come from INDEXA, The German DX Foundation, The Southeast DX Club, The Greater Milwaukee DX Association, The Eastern Iowa DX Association, The Northern Illinois DX Association and most recently The Twin City DX Association. We sincerely appreciate this support, and would love to see your club or organization added to this growing list. July 8, 2017: We regret that Steve, VE7CT has had to cancel his plans to join us on Bouvet. Steve has traveled with us multiple times, and we will miss him. Steve has recommended his good friend Paul, W7IV to take his place. Paul brings years of maritime experience, a love of contesting and the zeal of a relatively new DXpeditioner to our Bouvet DXpedition. We welcome him to the team. 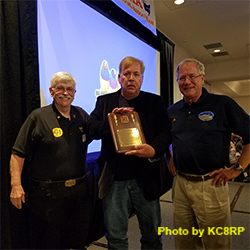 Dayton 2017: The Bouvet team proudly announces that our team member, Jerry Rosalius, WB9Z was inducted into the DX Hall of Fame at the annual Dayton DX Dinner. Shown with Jerry are Bob, N2OO (left) and Ralph, KØIR (right). 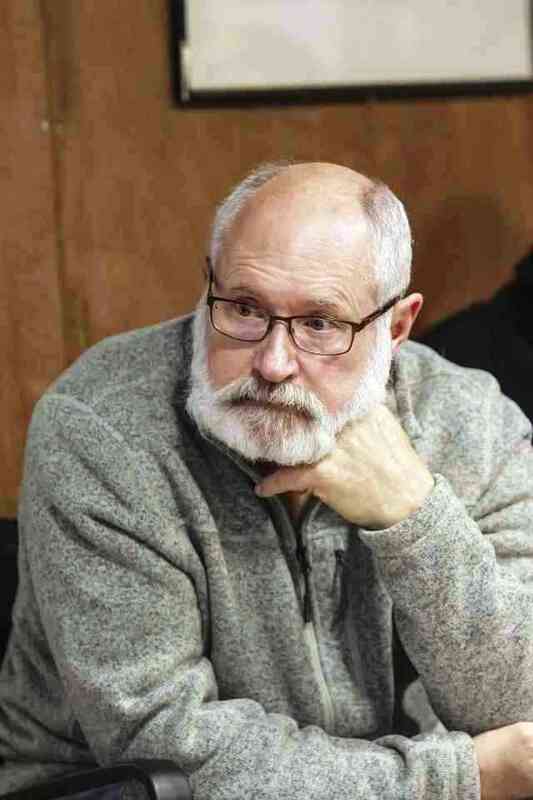 Jerry’s accomplishments in DXing are legendary, but his outstanding traits making him so worthy of this honor are honesty, integrity and character. 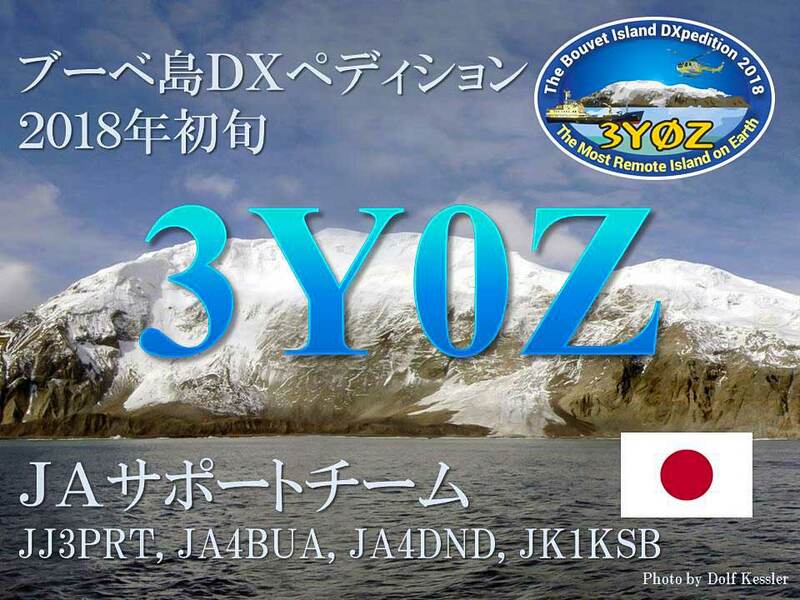 With Jerry, there will be four DX Hall of Fame members on the Bouvet DXpedition (WB9Z, WØGJ, K4UEE & KØIR). 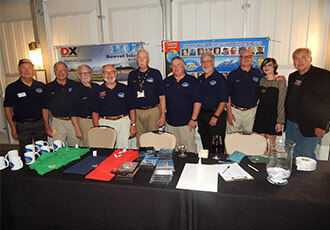 Left: 10 Bouvet DXpedition team members attended Dayton. Shown left to right: K9CT, KØIR, N4GRN, WØGJ, K4UEE, N9TK, W8HC, W6IZT and daughter KJ4PQV and WB9Z. Not shown is EY8MM. Photo courtesy of K8CX. Center: Team meeting. Clockwise from the bottoM: K9CT, EY8MM, N9TK, KØIR, Collin (grandson of N4GRN), K4UEE, W6IZT, KF4PQV and WØGJ. Taking the photo and not shown is W8HC. 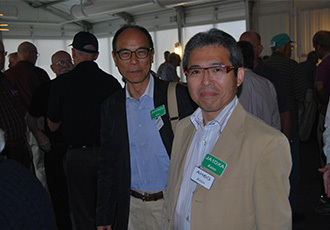 Right: Two visiting Japanese friends and supporters: JH1ROJ and JA1DXA. Our low band specialist, Nodir, EY8MM gave an outstanding presentation at the Low Band Dinner in Dayton. 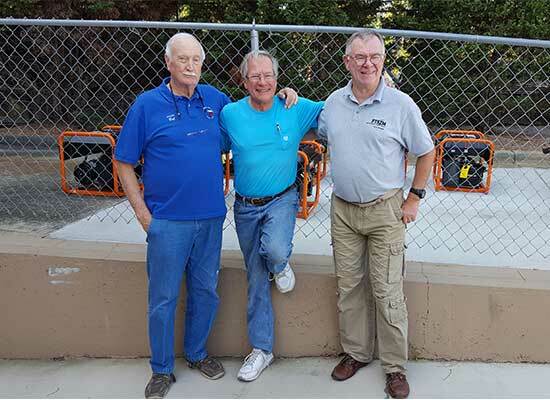 He discussed the evolution of our low band antennas and operating strategies, and how they have led to an ever increasing number of low band QSOs on our DXpeditions. May 5, 2017: We are extremely pleased to announce new transportation arrangements. We have arranged these with consultation from Nigel Jolly. 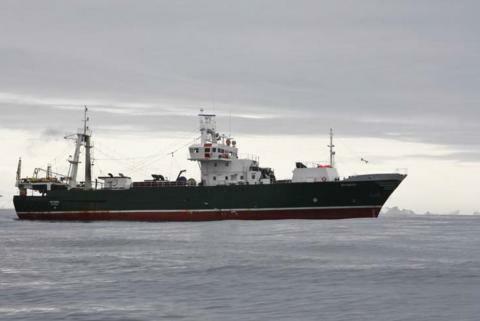 A Chilean vessel equipped with heavier-duty helicopters will take us from Punta Arenas, Chile to Bouvet Island, as scheduled. Read Press Release #5, accessed from the lower right sidebar, for the full story. May 1, 2017: We have added a propagation page to our website. It displays a series of videos showing propagation predictions during our anticipated stay on Bouvet Island — January & February of 2018. Find the page in our header menu, and click on one of the videos to display time, frequency and strength of signals anticipated at your QTH. The predictions are based on the average sunspot numbers predicted by the National Oceanic and Atmospheric Administration (NOAA) for January of 2018. 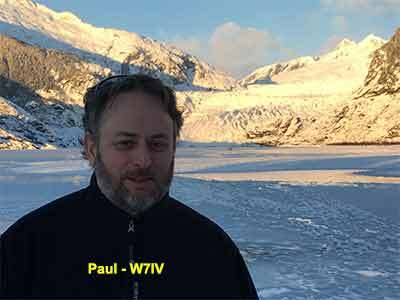 March 27, 2017: Franz, DJ9ZB will be unable to join us in the Bouvet DXpedition. We enjoyed working with Franz on Malpelo, and regret losing him. Many of you know Pista, HA5AO who will now be joining our team. Pista is well know for his previous DXpeditions, innovative talents, humanitarian projects, problem solving abilities and operating skills. 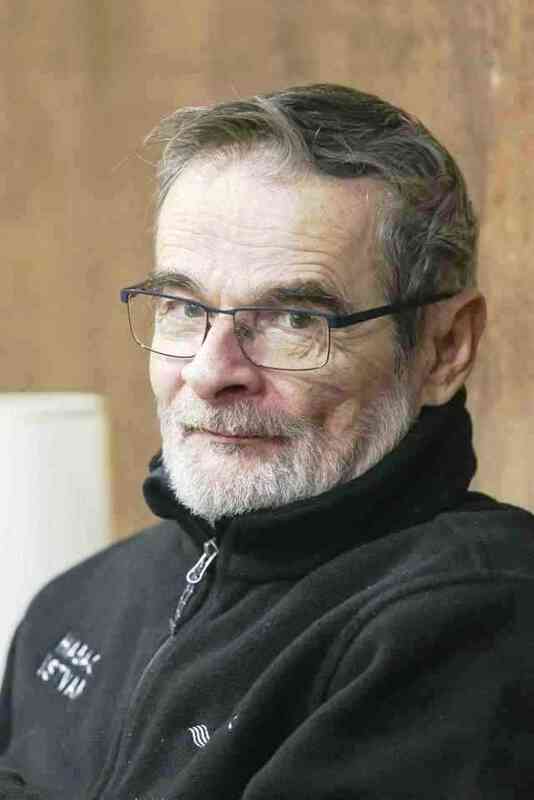 It is a pleasure to have him with us on the Bouvet Island DXpedition. 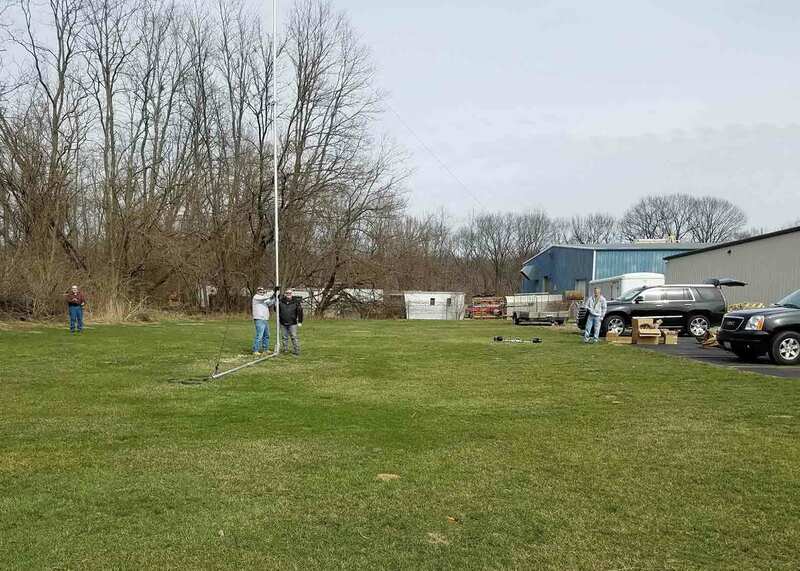 March 9, 2017: K9CT, K9NU, N9TK, WØGJ, and WB9Z met at K9CT’s QTH to assemble, erect and test the 3YØZ antenna masts manufactured for us by DX Engineering. The rugged construction and falling derrick system will allow for quick deployment and mechanical stability in the hostile weather of Bouvet Island. February 12, 2017: We regret that Jorge, HK1R will not be able to join us on the Bouvet DXpedition. 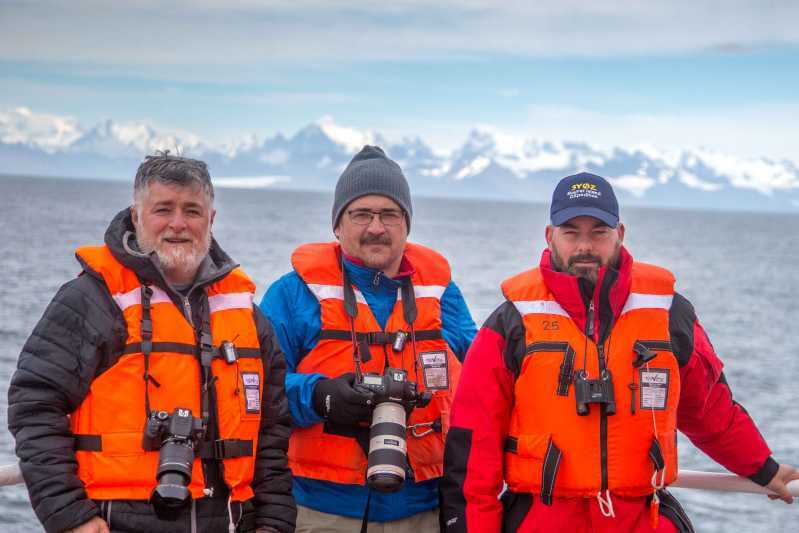 Jorge was with many of us on the Malpelo DXpedition and the Amsterdam Island DXpedition. We will miss him greatly on the upcoming Bouvet trip. Hopefully, Jorge will be able to join us on another adventure in the future. We look forward to that, and thank him for his help thus far. Harumi Kukita “Hal,” JR4OZR will be taking Jorge’s place on the team. 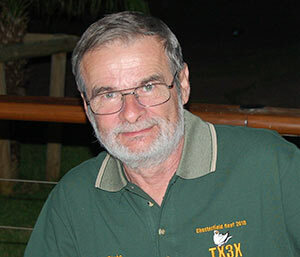 Hal has past DXpedition experience and is a well known and competitive contest operator. We welcome him to our team. 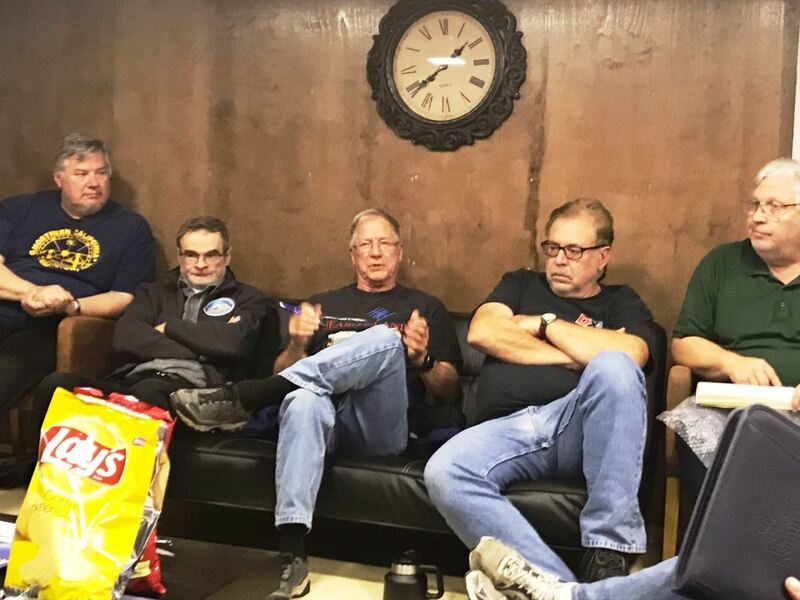 On January 11, 2017, five of the 3YØZ operators (KØIR, N9TK, W8HC, WØGJ & WB9Z) and Chief Pilot, NV9L met with Tim Duffy, K3LR and 11 members of his DX Engineering staff. The chief topic of discussion was development of masts and antenna support hardware able to withstand the winds and weather of Bouvet. The HF antennas and EME arrays need to be at a height where they can be effective, and yet able to withstand the harsh conditions of Bouvet. Working drawings were developed, and the engineers at DX Engineering are now developing prototypes for testing. 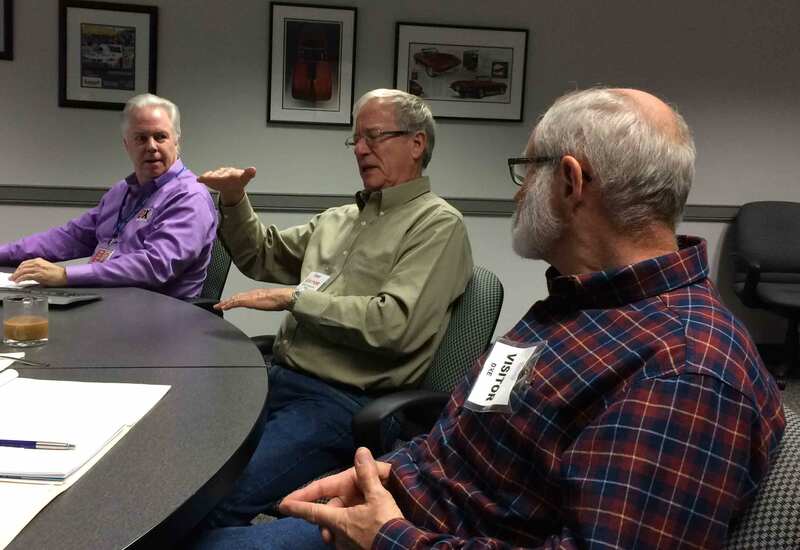 The group also considered how products developed for Bouvet might also serve unique needs of other radio amateurs. 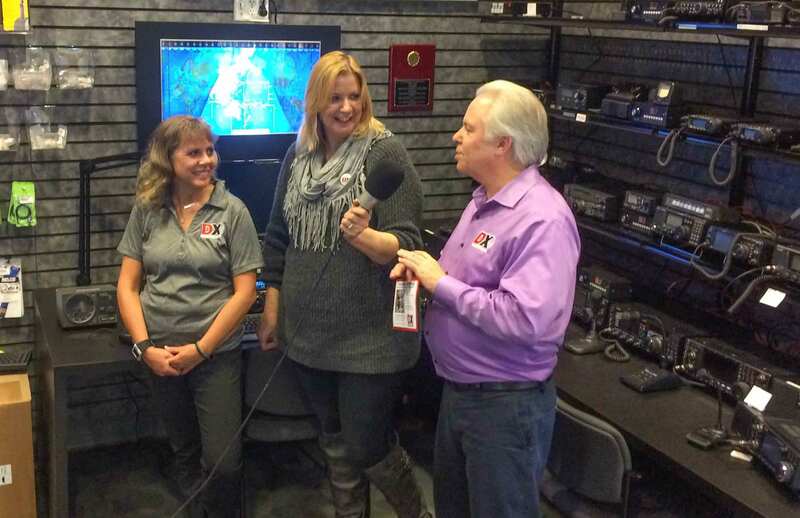 Bouvet Island DXpedition chief pilot Val, NV9L interviewing Tim, K3LR and Teri, K8MNJ from DX Engineering. Tim, K3LR leading discussion about DX Engineering’s involvement in the Bouvet Island DXpedition. Ralph, KØIR discusses snow anchor dimensions as Tim, K3LR and Glenn, WØGJ look on. 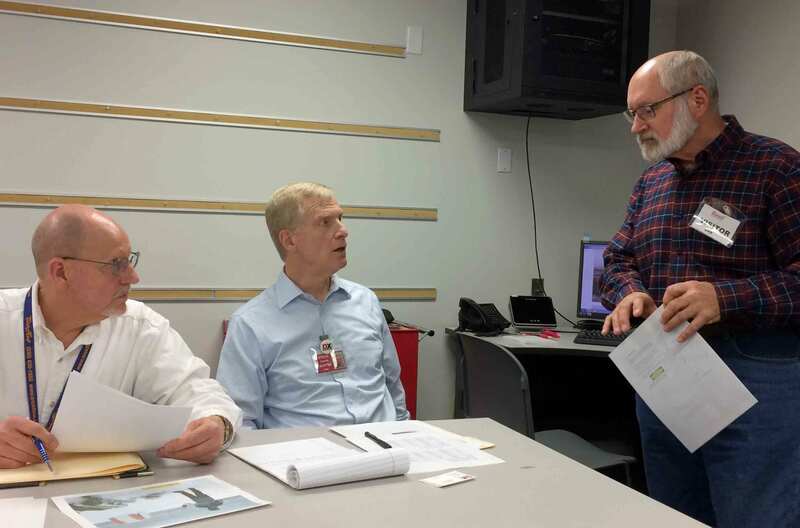 Glenn, WØGJ discussing a falling derrick antenna system with engineers from DX Engineering. 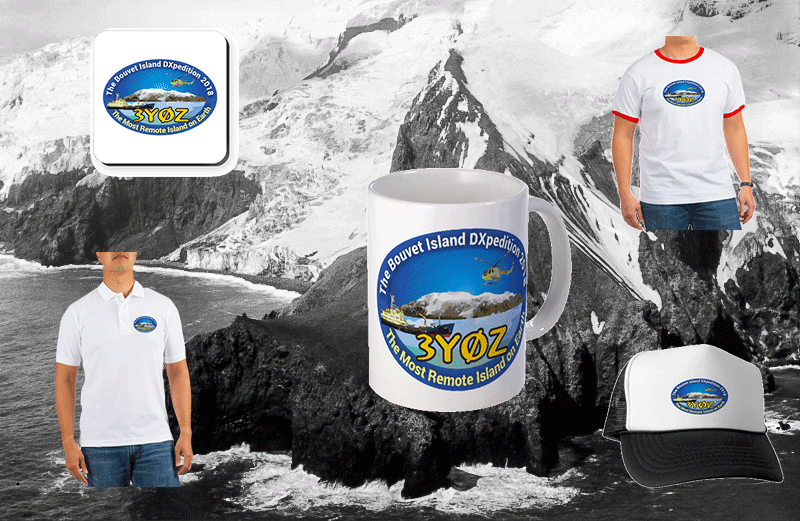 Now you can help the DXpedition, and at the same time, enjoy souvenirs and memorabilia of the upcoming Bouvet Island DXpedition. Cups, mugs, T-shirts, sweatshirts, bags, hats and more are available. Click on the image to the left to visit our store at CafePress. 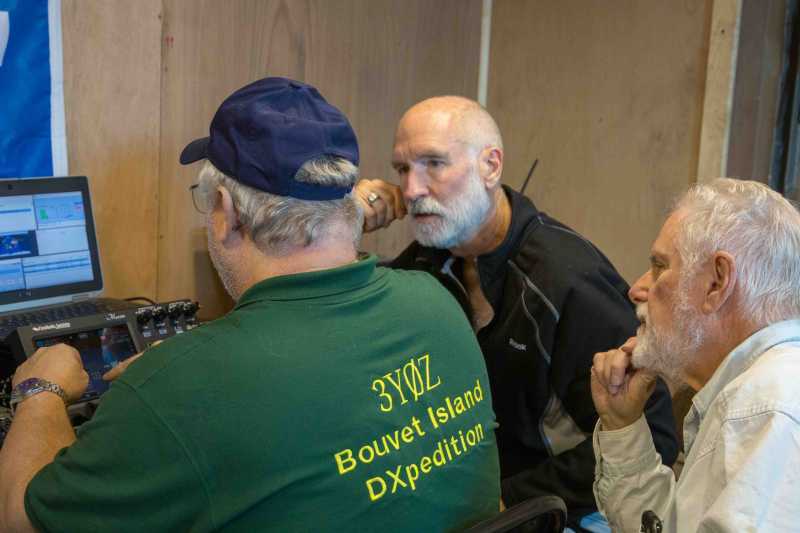 A DXpedition to Bouvet is not to be taken lightly. Bouvet is a serious and dangerous place; demanding attention to safety, serious planning, physical and mental endurance, time to allow for storms and rough seas and a team with the right balance of size, experience, talent, emotional stability and sense of purpose. We feel we have met these criteria, but, when we arrive at Bouvet, we also need to attend to our obligations to you, our financial supporters and DX audience. How we meet those obligations and expectations will define us as a team. It is our belief that, given the rarity of this entity, we must pull out all the stops. We must utilize maximum legal power, the best antennas, world class transceivers, propagation studies, the best location on the island, a safe vessel and crew, highly qualified helicopter pilots and the complementary resources of our team. We will need near real time information flowing to us through our extensive pilot system, so that we can maximize our primary purpose — providing QSOs. We have a conscience. We will not do this just for the sake of doing it and end up using a compromised location, less than 24/7 coverage of all open bands, limited power, inefficient antennas and insufficient time at the island. 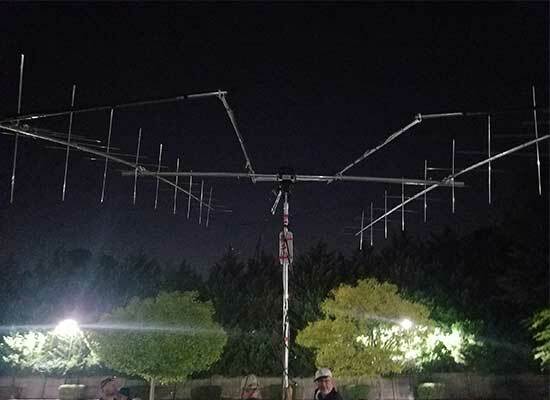 We want to do this right, and give everyone the best possible chance of making the QSOs they desire – be they on 160, the WARC bands, SSB, CW, RTTY or 6 and 2 meter EME. 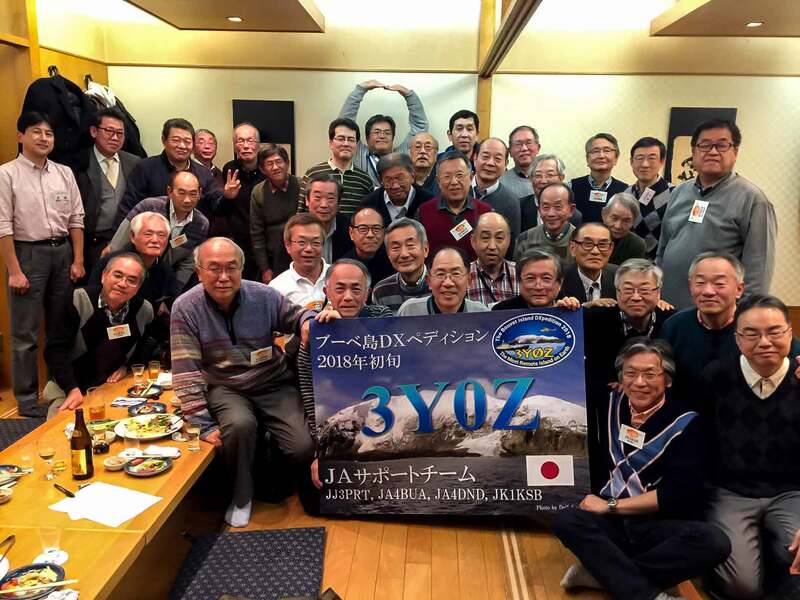 JA4DND – Hiro, JJ3PRT – Joe, JA4BUA- Kuwa, and JK1KSB – Oku have organized a Bouvet Island DXpedition support group in Japan. 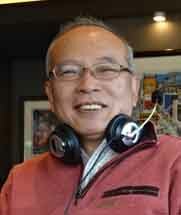 They will work with Japanese DXers and DX Clubs. 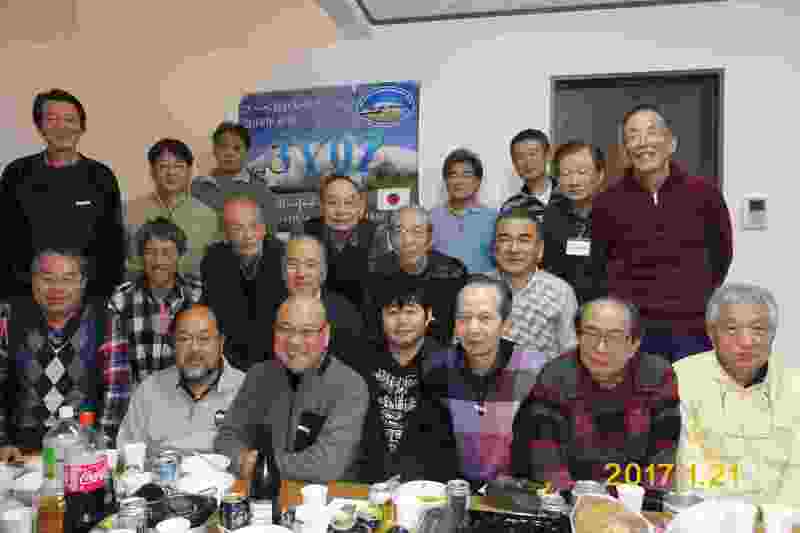 Members of the Far East DXPloiters gather for their year end party. 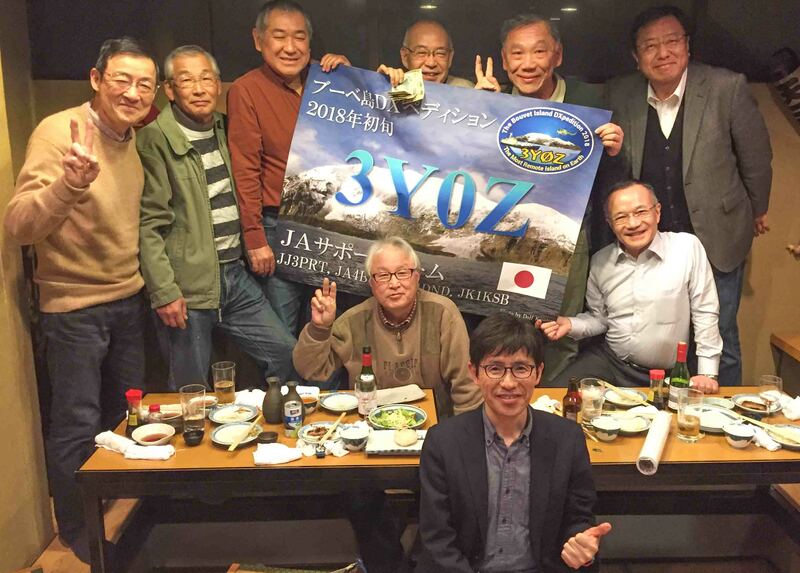 As part of their celebration, they are displaying the 3YØZ banner. We thank the FEDXP for their support. 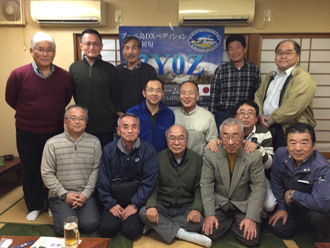 The Toyama DX Club supports the Bouvet Island DXpedition 3YØZ at their party. 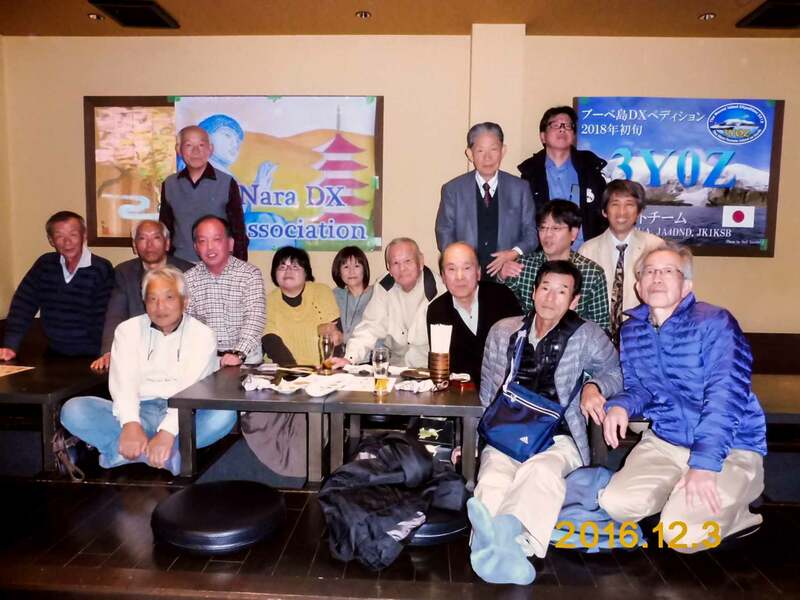 Members of the NARA DX Association supported the Bouvet Island DXpedition at their year end party. 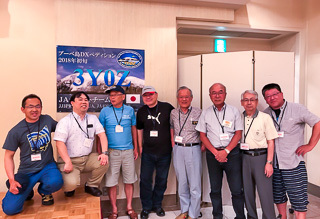 Well known YL DXers from Japan: JP3AYQ – Mami and JO3VCN – Masae. Mami is famous for her Pacific Islands DXpeditions. Tokyo 610 DX Group New Year Party. 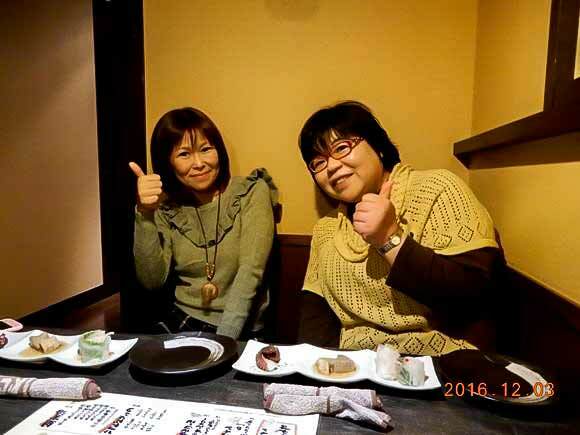 End year party of Matsue DX Group. 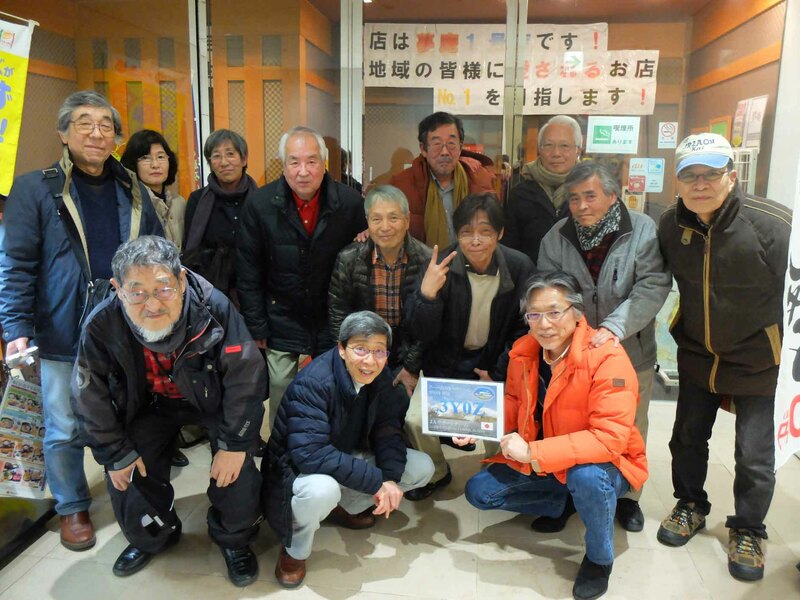 The Tokyo Odakyu Line DXers support 3YØZ. 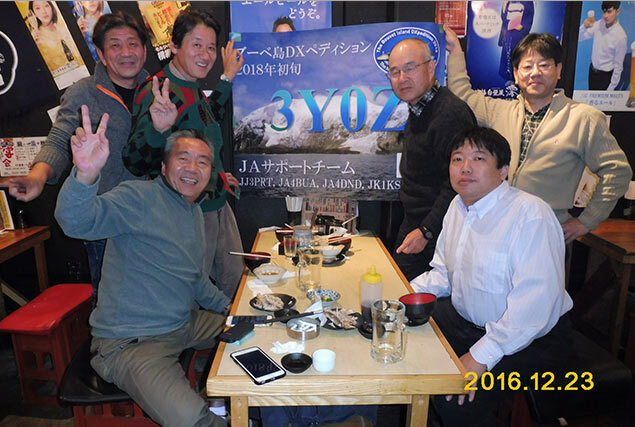 The Osaka Area Hams meet and support 3YØZ. 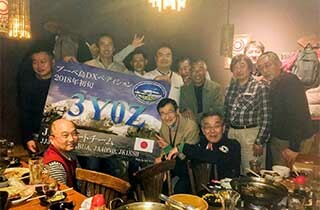 The Tokyo Machida Drunkards DX Club celebrates 3YØZ. 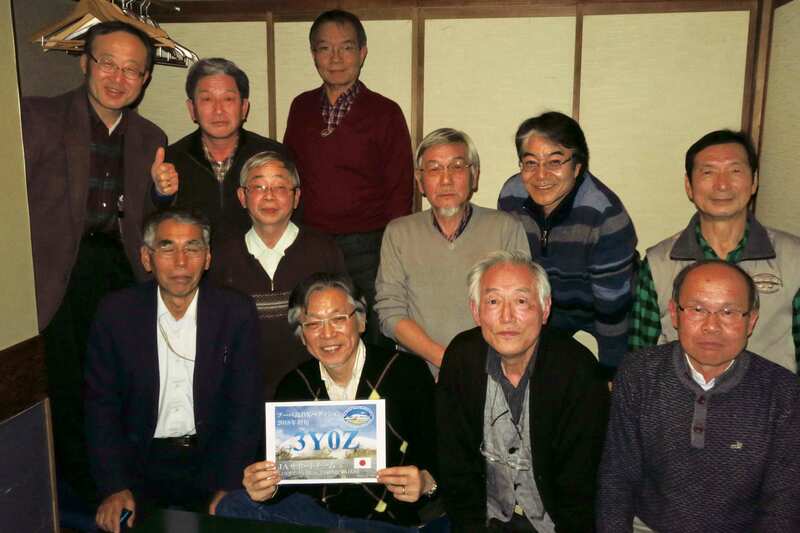 The Kyushu DX Group supported 3YØZ with a very nice contribution.